Jeremy Tatum writes: Apologies for a few days’ delay – I have been laid low by some sort of ailment, which kept me in bed or at least in apartment for a few days. Back in business now. 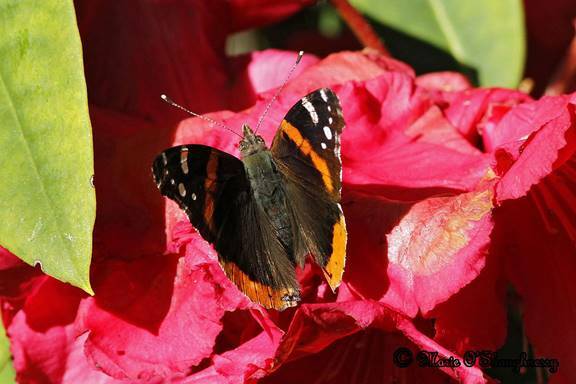 Marie O’Shaughnessy writes: First time I have ever seen a Red Admiral at Government Gardens. There were 4 Western Tiger Swallowtails in the same area, along with a Western Spring Azure and two Cabbage Whites. Taken this afternoon at 5.30 pm May 24/2014. 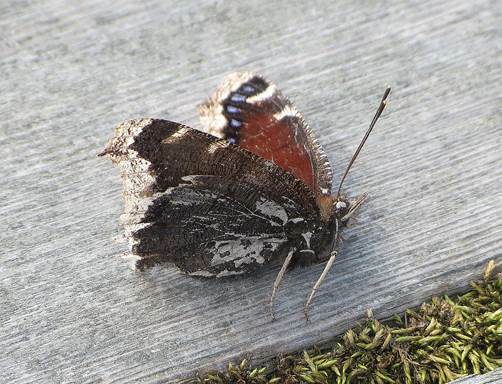 Jeremy Tatum writes: Marie’s is the first Red Admiral I’ve heard of this year. I saw a Mourning Cloak at Hillman Trail (Metchosin) on May 24. Also my first Western Tiger Swallowtail this year, at my Saanich apartment. Val George writes: I took this photo of a Common Ringlet (if you prefer, Coenonympha tullia [ yes, I do! – Jeremy!]) at Rithet’s Bog today, May 24. 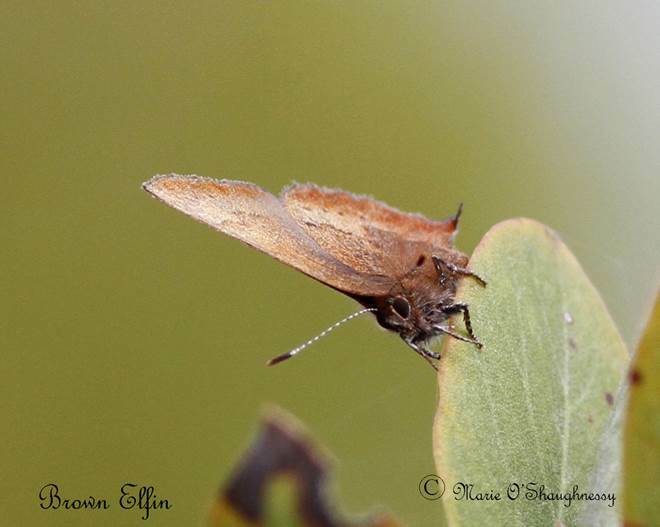 He photographed one of 6 Purplish Coppers at Island View Beach on May 27, around the patches of Black Knotweed Polygonum paronychia, which is doubtless the larval foodplant. Also there were a Common Ringlet Coenonympha tullia, a Western Tiger Swallowtail (alas no Anises on the Lomatium or the Glehnia!) and 8 Cabbage Whites. 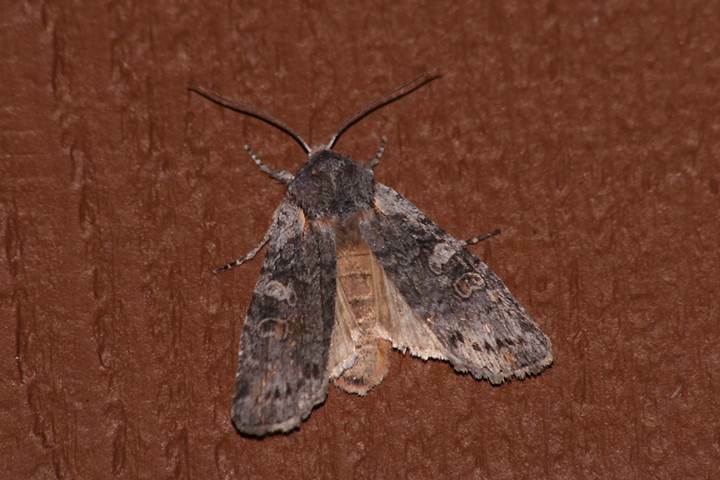 Bill Katz sends a photo of the moth Lacinipolia patalis from Summit Hill, May19. 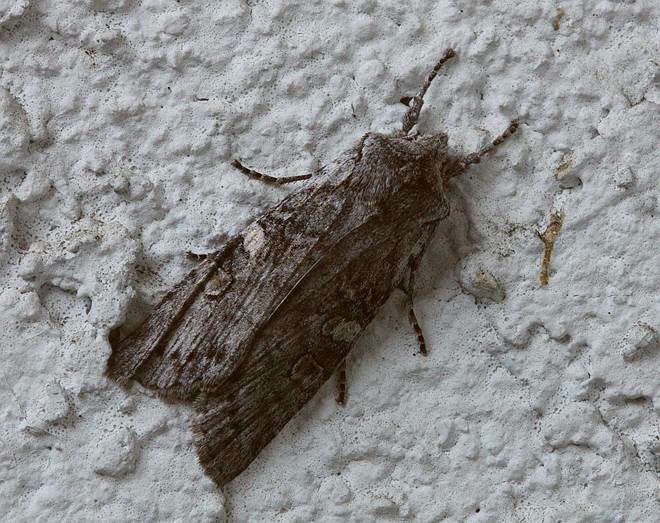 Jeremy Tatum sends photos of three moths from his Saanich apartment, May 28-29. The female Polyphemus Moth that has been at the front door of the Swan Lake nature house for several days has moved, and is now at the right hand side of the door at an eminently photographable height. Her patience has been rewarded, for she has been visited by a male suitor, who has large bipectinate antennae. He is on the ceiling above the door, and not so easily photographable. Chantelle Tearoe, Office Coordinator at the nature house, snapped this picture of the female. As you can see, the moth has just laid an egg. She will doubtless lay many more on the wall of the nature house. The caterpillars will have to be rescued, otherwise they will starve unless given some nice leaves. 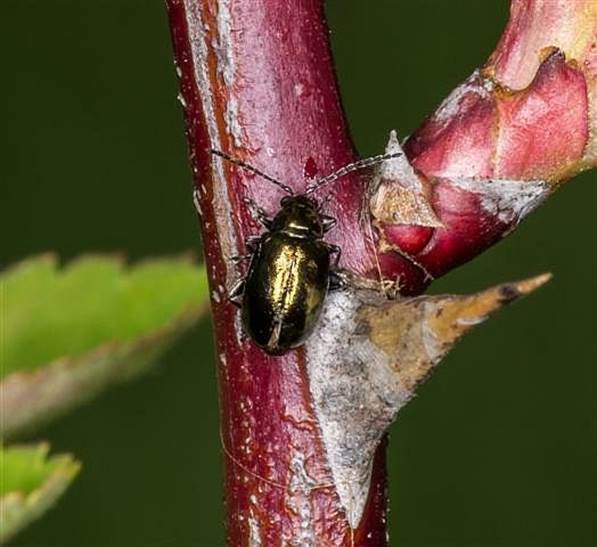 They have been found on many trees and shrubs, but willow or alder are safe bets. 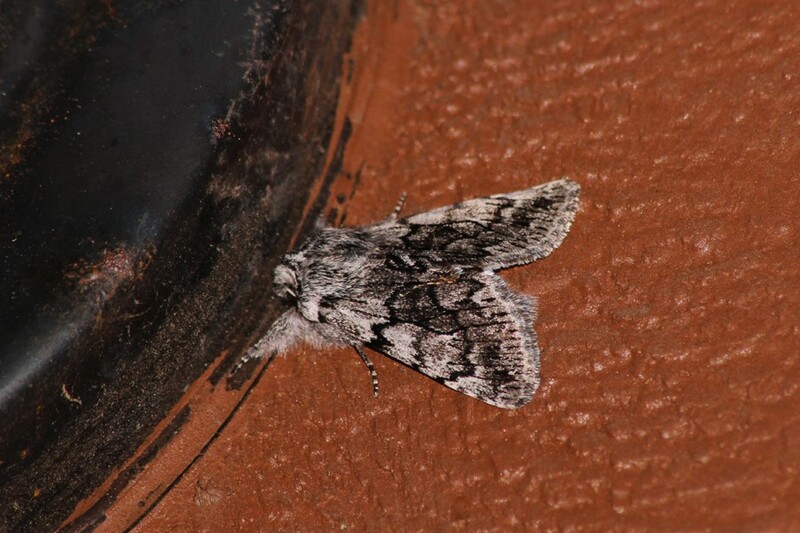 Bill Katz found Jeff’s Silvery Blues on May 22. He writes: I drove back to Helmcken and found the bus stop across the road from the exit ramp – it’s actually on the entrance ramp to the Hwy going north from the hospital. 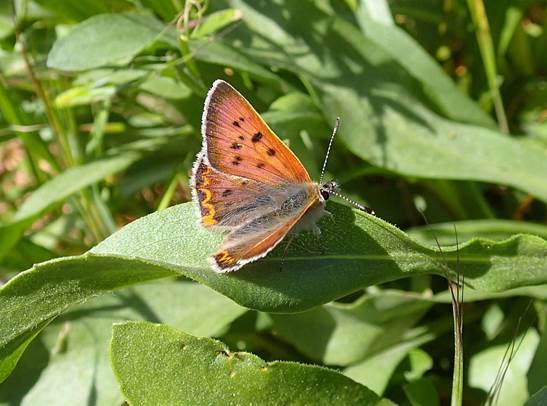 Jeremy Tatum reports a Purplish Copper on May 22, on the East Saanich IR, north of Island View Beach. 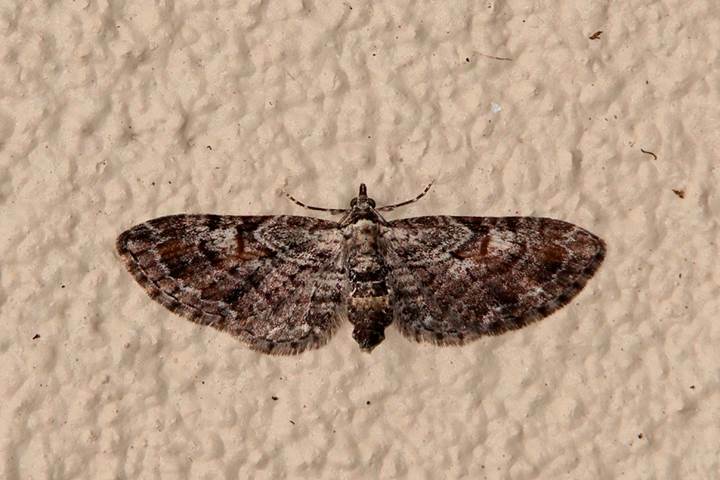 Jeremy Tatum writes: The moth below was at my Saanich apartment of May 21. 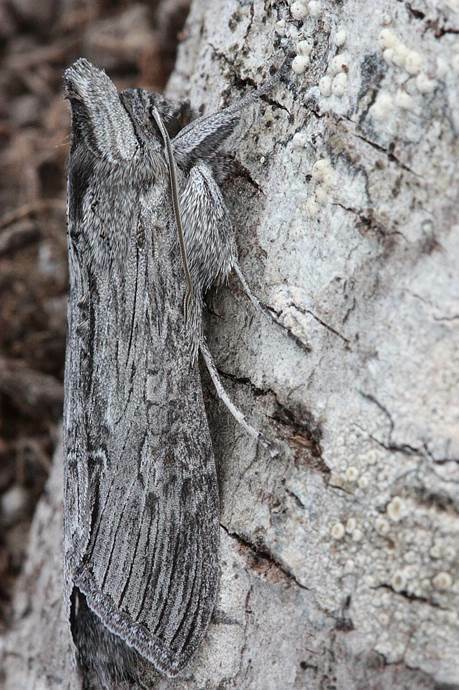 As mentioned on May 16, I’ll continue calling it Cerisy’s Eyed Hawk Moth Smerinthus cerisyi for the time being, although some authors are now treating the race ophthalmica as a full species. 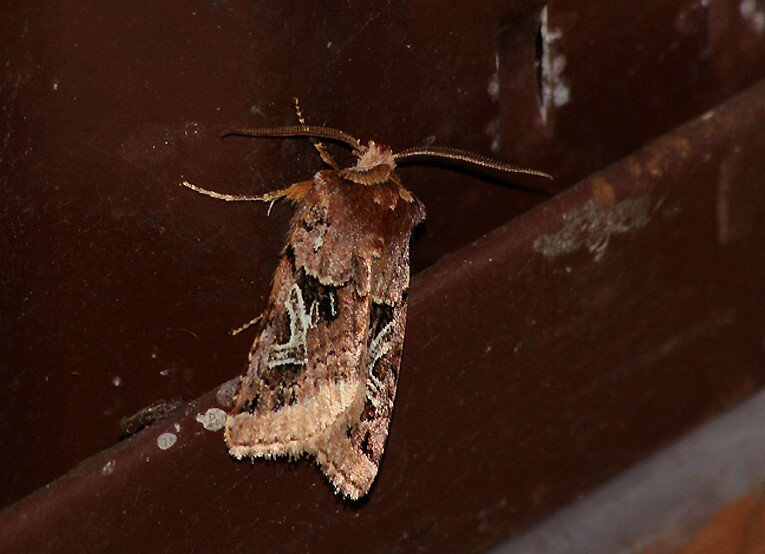 I released this moth in the Blenkinsop Valley after photographing it. Last fall, Bill Savale found an unfamiliar caterpillar on Grindelia at Island View Beach. 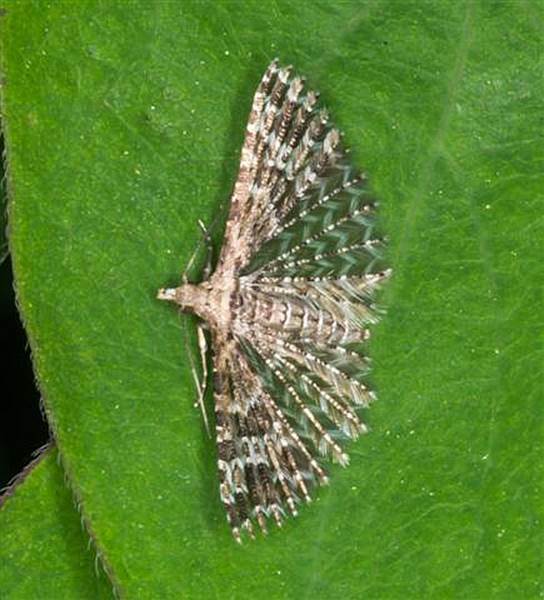 It somewhat resembled the familiar Cucullia montanae, but it didn’t seem quite right, and, in its final instar, it was clear that it was some other species. Jeremy Tatum kept the caterpillar. 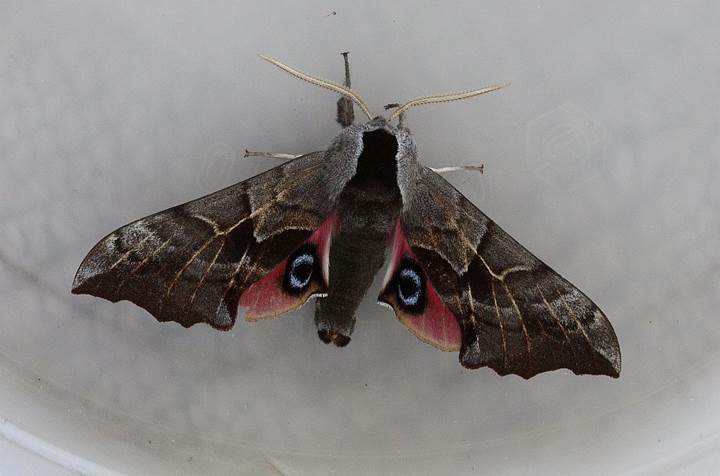 The moth emerged on May 22, and, after it had posed for a photograph, he took it out to Island View and released it. 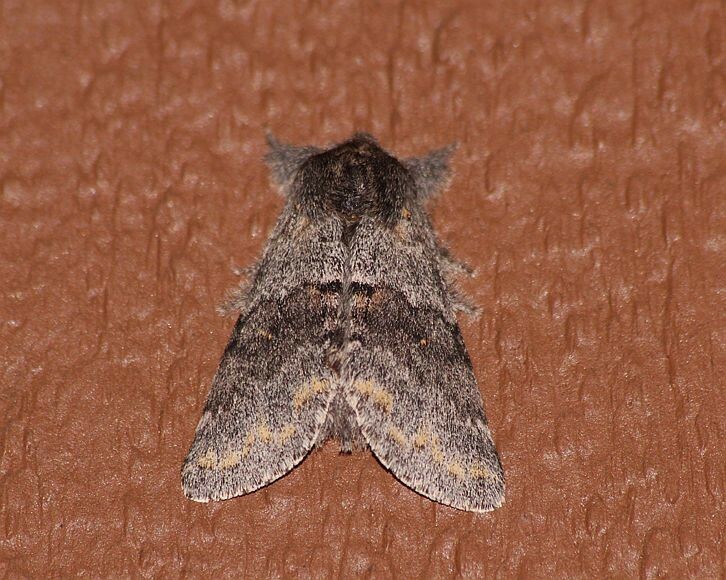 The moth has a “hood” over its head. 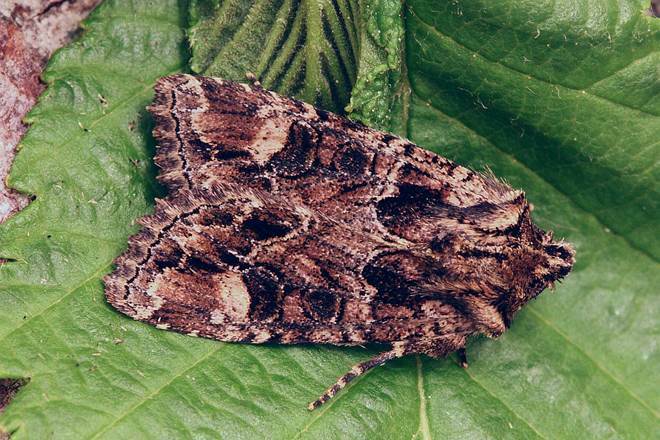 The Latin for “hood” is cucullus – hence the generic name of the moth. Notice to Contributors. While this site was originally conceived as an “Alert” it has also developed into a great Photo Gallery as well. The “Alert” function has been a bit diminished since we lost the “Send2Page” facility, and we are at present not able to post all contributions immediately. We are looking into ways in which we might be able to restore a more immediate response and hence restore the “Alert” aspect. We will continue to welcome contributions of both “Alert” and “Photo Gallery” nature. However, in the case of some of the commoner species that are not “Alerts” (except perhaps for first occurrences in a season), or invertebrates of which you may have several photos, we draw attention to the VNHS Flicker sites, one for general photos (https://www.flickr.com/groups/vnhs/) and one specifically for the InvertAlert (https://www.flickr.com/groups/invertalert). To join or add photos to these sites, just click on the links and follow the instructions on the site. If you already have a Yahoo or Flickr account, the process to add the group is very easy. 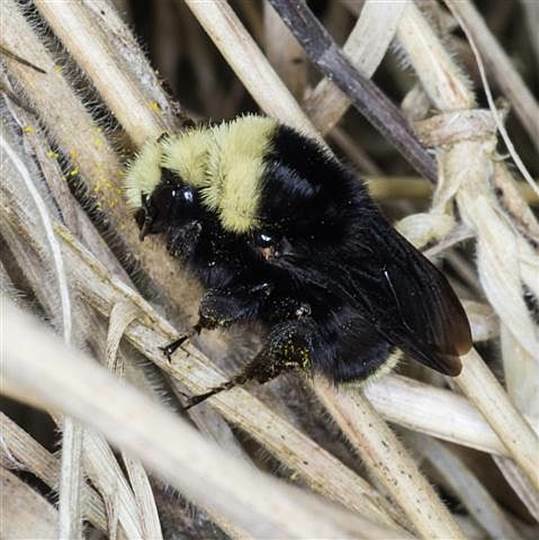 Jeff Gaskin writes (May 20): Two more Mourning Cloaks to tell you about, and what a year they are having, one was in Hyacinth Park and one was at Panama Flats. Also, of interest were 2 Western Tiger Swallowtails seen at Panama Flats. Jeremy Tatum reports yet another Mourning Cloak, from Swan Lake, May 19. 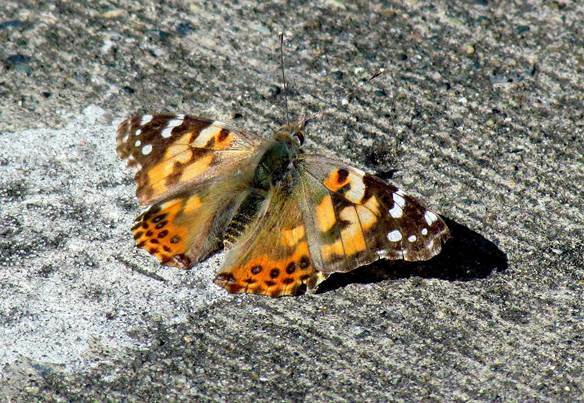 And on May 20 there were two Painted Ladies and a West Coast Lady near the Jeffery Pine at the top of Mount Tolmie. 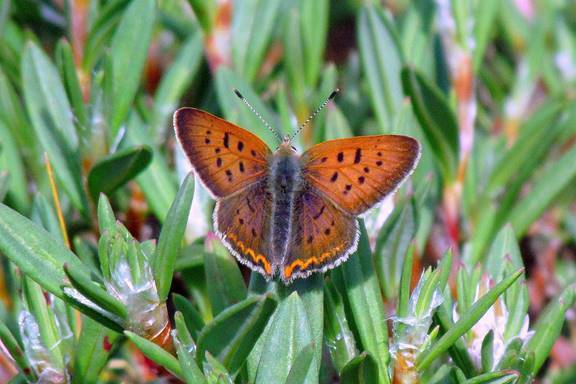 Rosemary Jorna sends a photo of a Purplish Copper from the narrowest part of Whiffin Spit, May 20. Val George writes: Butterfly photos from May 19. 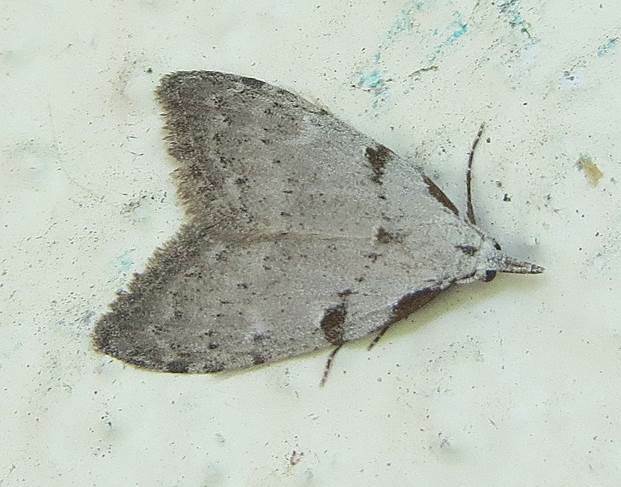 The Mylitta Crescent was taken at Harewood Plains near Nanaimo. The Pale Swallowtail is from Panama Flats. Jeremy Gatten sends a photo of the rather destructive defoliator playing havoc with the Garry Oaks in Uplands Park. 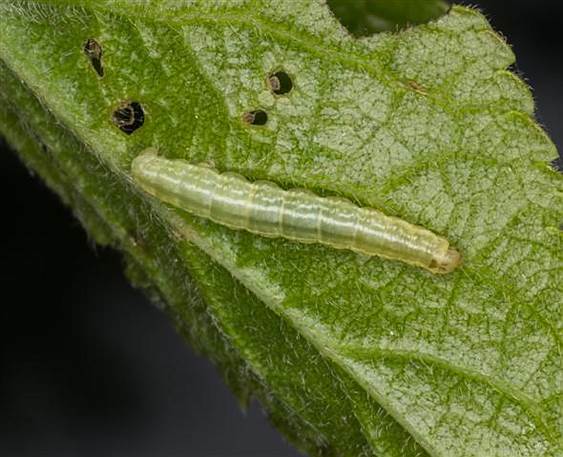 It is the caterpillar of the moth known currently as Erannis vancouverensis, though Jeremy Tatum wonders whether it might in fact be an invader from Europe, E. defoliator. 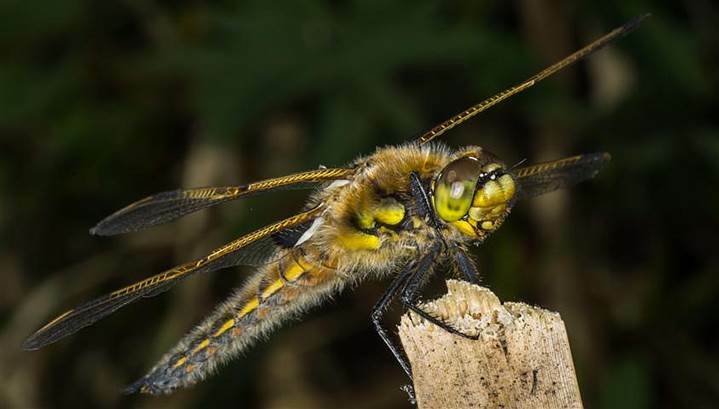 Ken Vaughan sends a varied bunch of insect photos from the weekend. The fly is from Swan Lake. 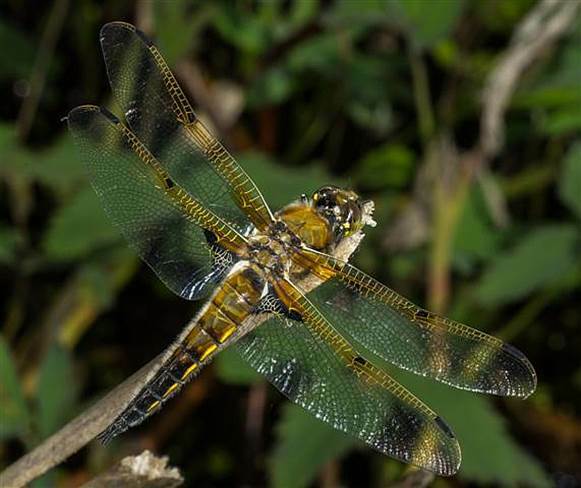 The dragonflies and damselflies are from Beaver Lake Ponds (one of the best dragonfly places in the area). The butterflies and moth are from Mount Douglas. 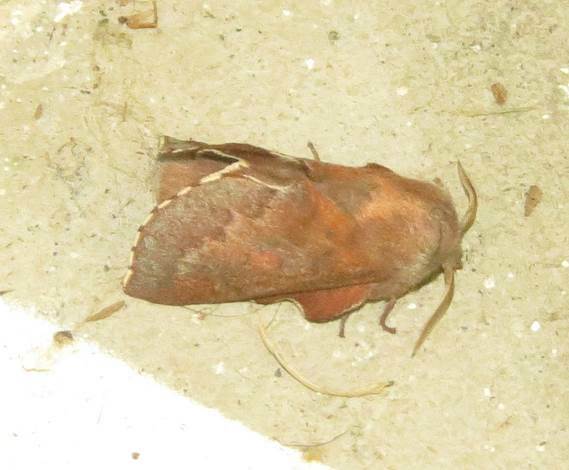 The Polyphemus Moth that has been near the left hand light above the door of the Swan Lake nature house for several days was still there on May 19. 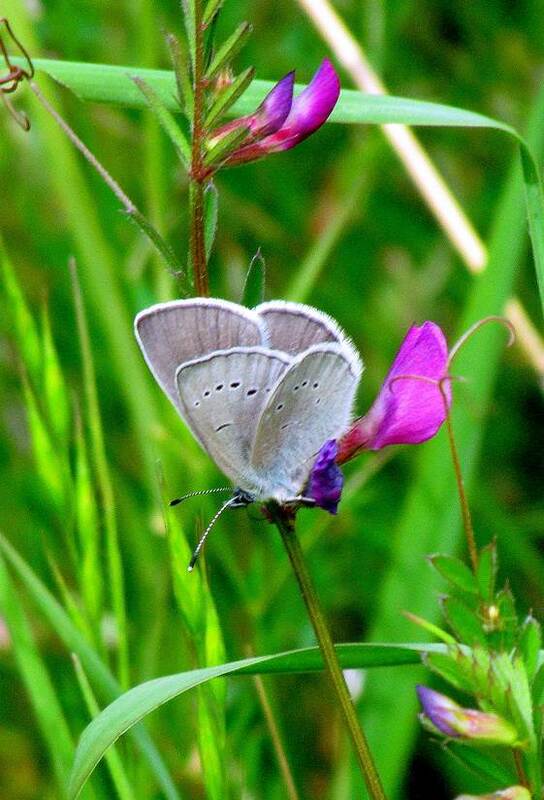 Jeff Gaskin writes: There were 5 Silvery Blues amongst the lupines at the Colwood exit of the Trans Canada Hwy. today May 18, and I found another Silvery Blue at Helmcken Road and the Hwy. This one was amongst lupines too. The spot is right behind a bus stop at the Hwy ramp and Helmcken . Also, of note I found a Mourning Cloak and a Western Tiger Swallowtail along the Galloping Goose trail between the Colwood exit and Goldstream Ave. Another Mourning Cloak and another Western Tiger Swallowtail were in front of the Oxford Inn at Gorge Road. and Albany Avenue. 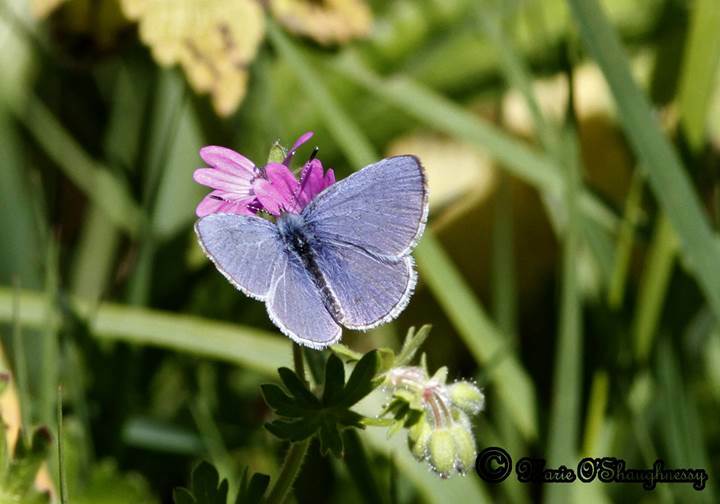 Jeremy Tatum visited Jeff’s Silvery Blue colony at the Colwood turnoff from the Island Highway on May 16. It was a windy day and difficult to catch more than a brief glimpse of the butterflies, though he did see three or four. There were many ova on the lupine flower heads, surprisingly visible even at a distance. 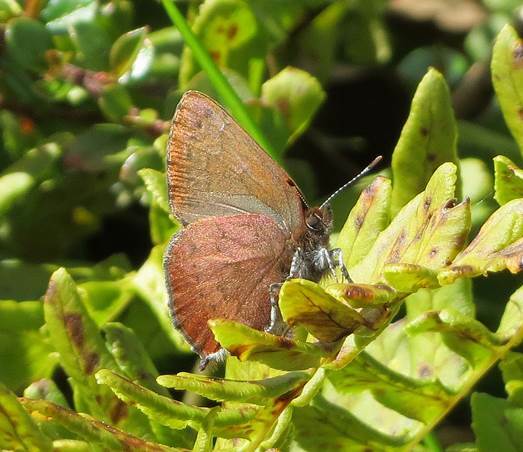 Also on May 16 he saw a Grey Hairstreak and a Mourning Cloak in front of the Oak Bay war memorial at Cattle Point, and two more Mourning Cloaks in Uplands Park. 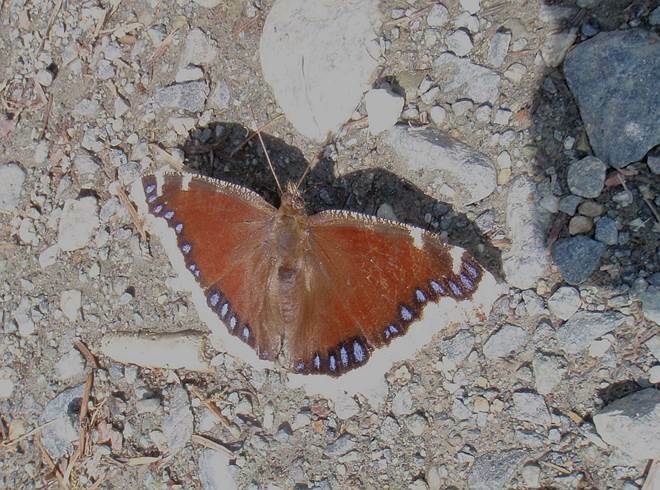 On May 17, there was a Mourning Cloak at Luxton Road, Langford, and on May 18 there was another Mourning Cloak at Vantreight’s bulb fields in central Saanich. Aziza Cooper writes: A Grey Hairstreak was on a clover blossom on the east side near the metal building at Panama Flats this afternoon. I’ve attached a photo. 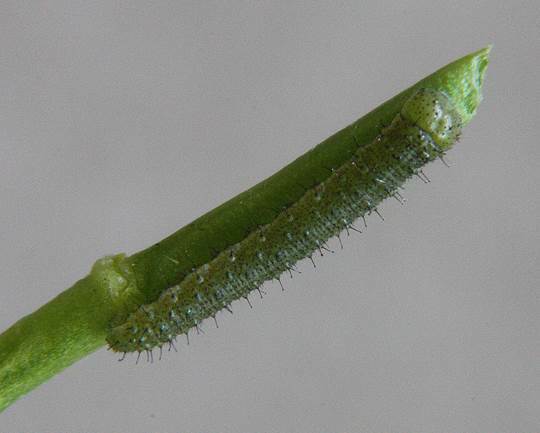 On May 17, Jeremy Tatum found a tiny Sara Orangetip caterpillar on Barbaria in the hydro line at Munn Road. 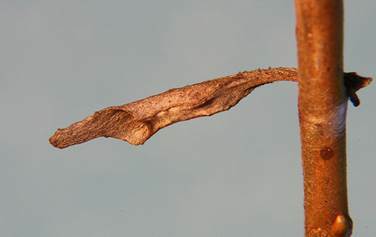 The leaves of many Viburum shrubs this week are brown and badly skeletonized. 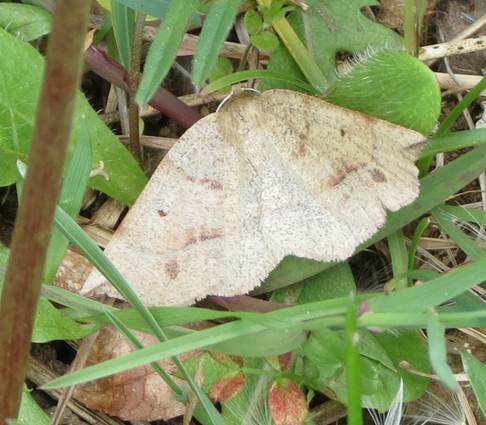 If you look underneath the leaves you may see many small blackish and yellowish grubs. 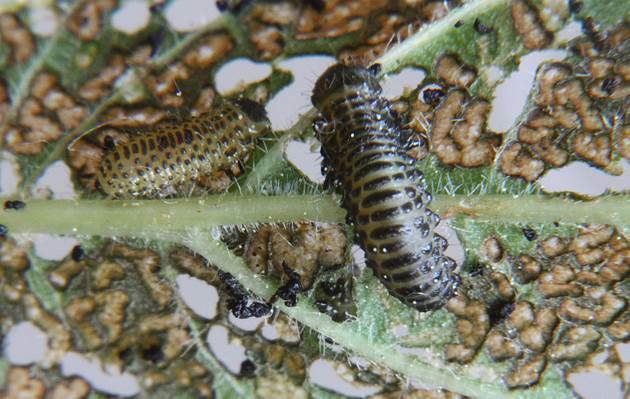 These are the grubs of the Viburnum Leaf Beetle. Jeremy Tatum photographed two of them at his Saanich apartment on May 17. 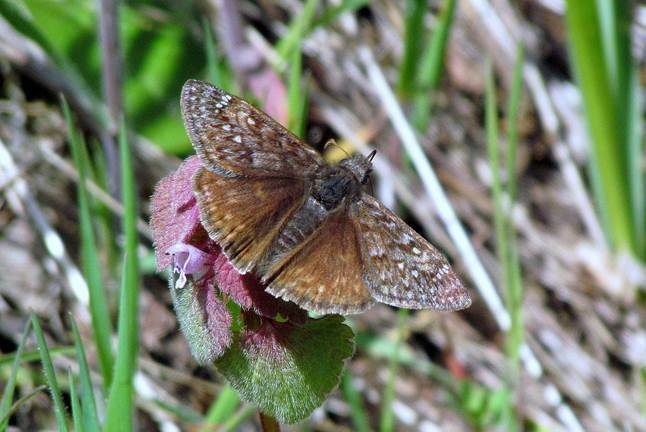 Gordon Hart writes: In our yard (Highland District) today (May 16), there were several Western Spring Azures and Cabbage Whites, one Pale Tiger Swallowtail and a Two-banded Skipper. 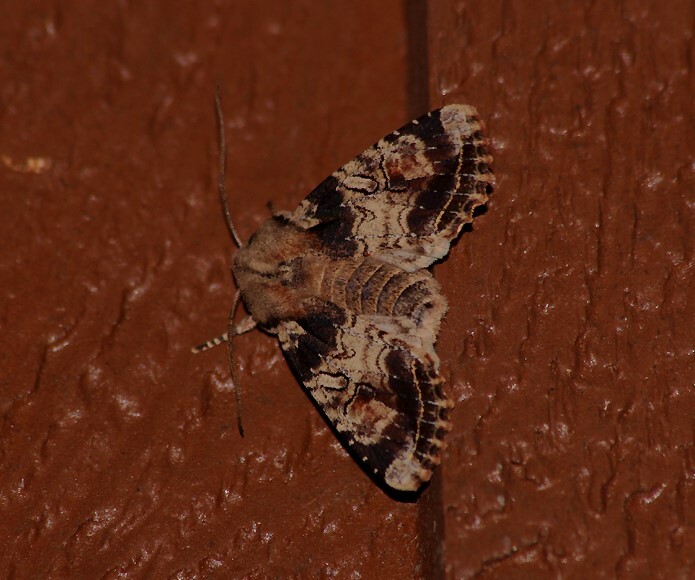 Bill Katz sends some moth photos. 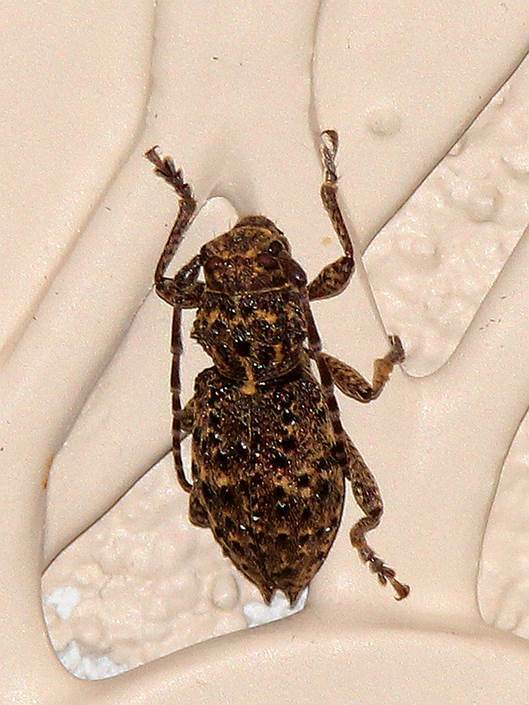 First the micro Udea profundalis, from his Summit Hill garage, May 16. The caterpillar is a nettle feeder. 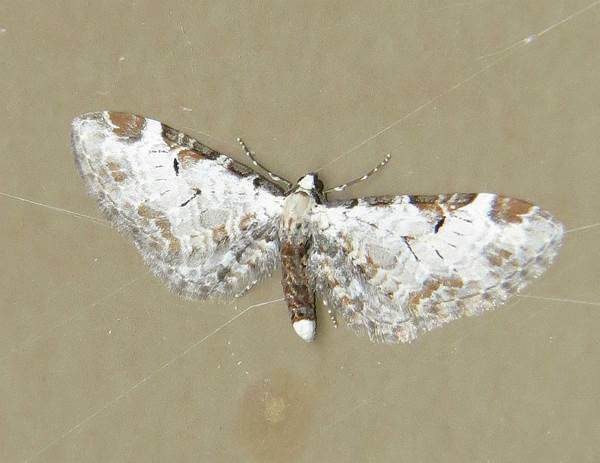 Next, the pug Eupithecia rotundopuncta from Goldstream Park, May 18. Now an American Lappet Moth from his productive Summit Hill Garage. 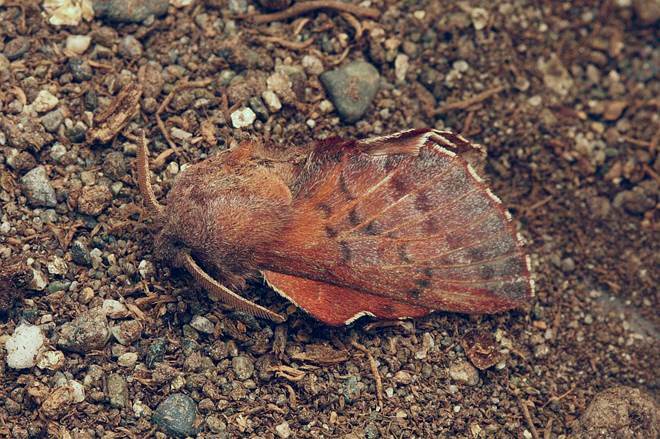 The way that this moth holds its fore- and hindwings is characteristic. 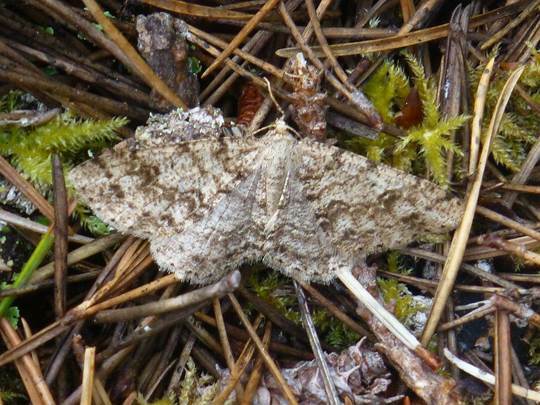 And finally, a new moth for this site, Metarrhanthis duaria, from Stewart Mountain, May 17. 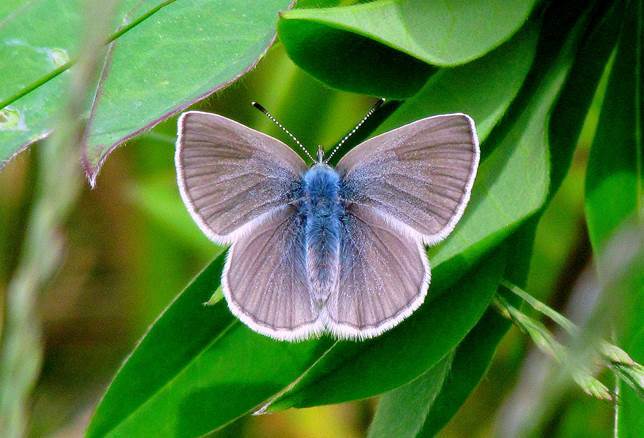 We are always looking for keen-eyed volunteers to submit butterfly records. If you would like to participate, please contact Aziza Cooper at tanageraz@yahoo.com. 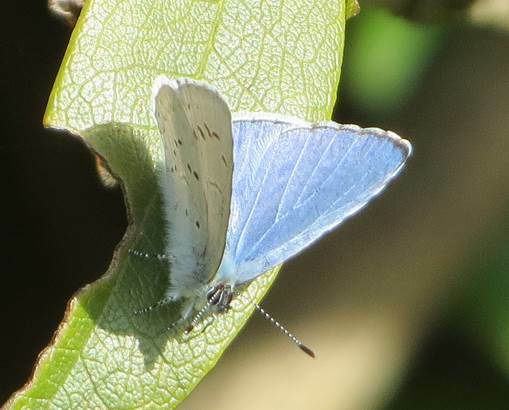 Val George, May 15, stopped at the Colwood intersection on the Trans Canada Hwy to check out the Silvery Blues reported by Jeff Gaskin. 4 or 5 were flying around the lupine patch and presenting good opportunities for photos. Jeremy Tatum shows a micro moth, freshly emerged from its pupa, from Mount Tolmie, May 15. 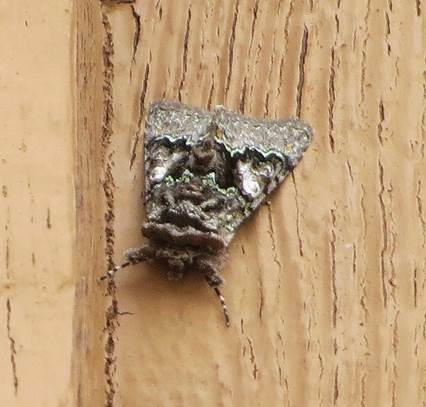 This is one of several moth species which, at a distance, look remarkably like bird-droppings. Seen close-up, the deception is revealed. 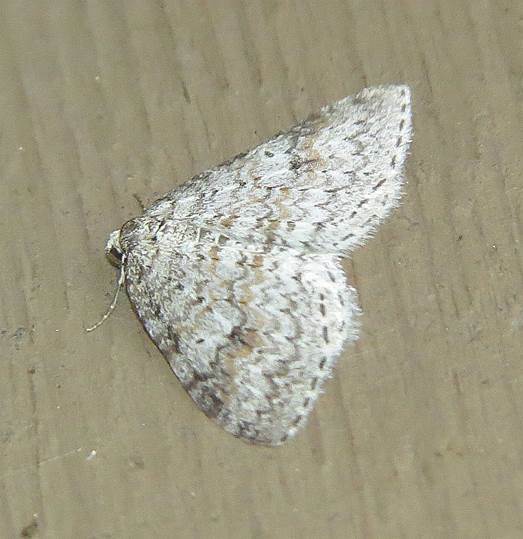 And on the same day Jeremy Gatten sends in a photo from Saanichton of another of these tortricid bird-dropping moths. 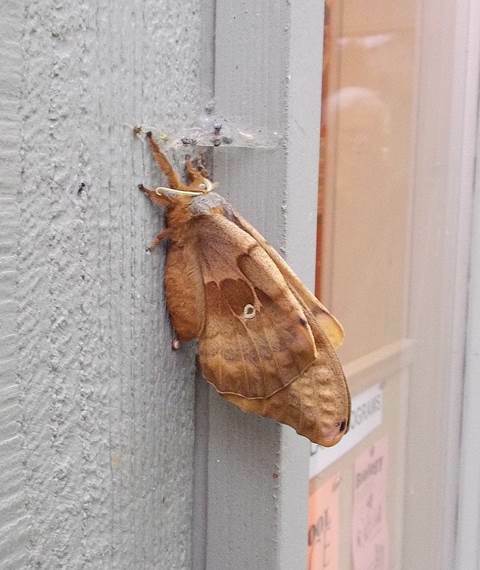 Some enthusiasts may have known that there has been a cocoon of the Polyphemus Moth outside the door of the Swan Lake nature house all winter. 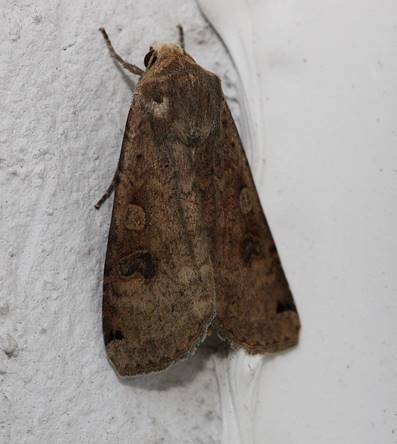 The adult moth emerged today (May 14), and this evening it was still sitting next to the lamp at the left hand side of the nature house door. It is a female. 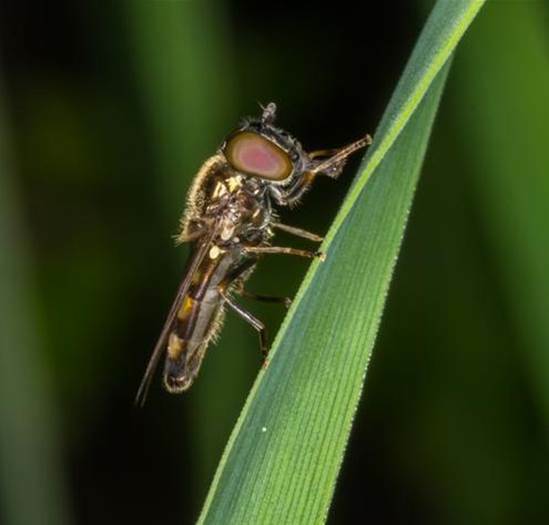 Females don’t fly around much – they don’t feed; they merely await the arrival of a husband. There is a fairly good chance that it will still be there tomorrow (May 15), so, if you have never seen a Polyphemus Moth before, here’s your chance. 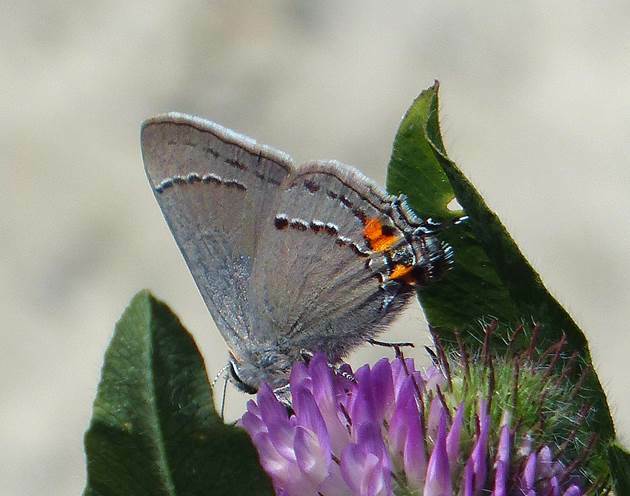 Val George sends a photo of a Grey Hairstreak from Cattle Point in Oak Bay this afternoon, May 14. 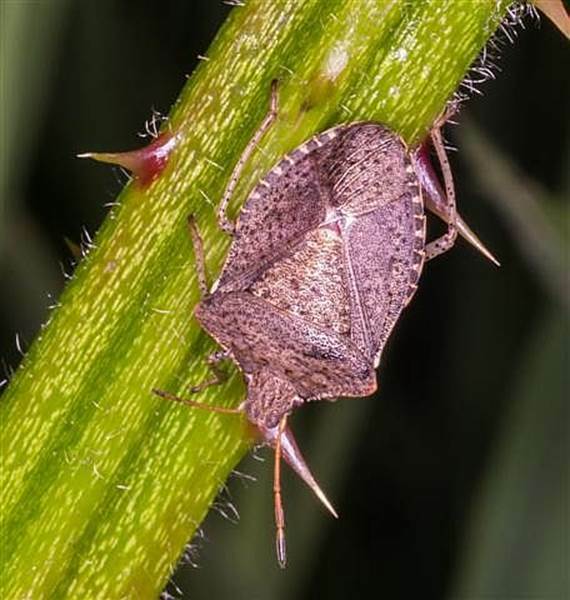 Aziza Cooper sends a photo of Autographa californica in the grass at Beacon Hill Park on the east side near Heywood and Park Streets. Jeff Gaskin reports a Western Tiger Swallowtail in Gorge Park today (May 14) – his first of the year. 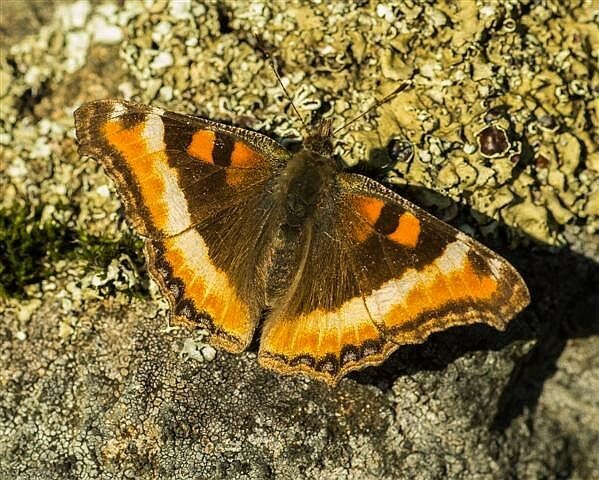 He reports that on Tuesday (naturally) May 13, The Tuesday Group went up Observatory Hill and saw 6+ Sara Orangetips, several Western Spring Azures, 2 Satyr Commas, and a Mourning Cloak. Another Mourning Cloak was seen from the car along West Saanich Road near Interurban Road. On May 12 there was a Mourning Cloak on Harriet Road near Obed Avenue. 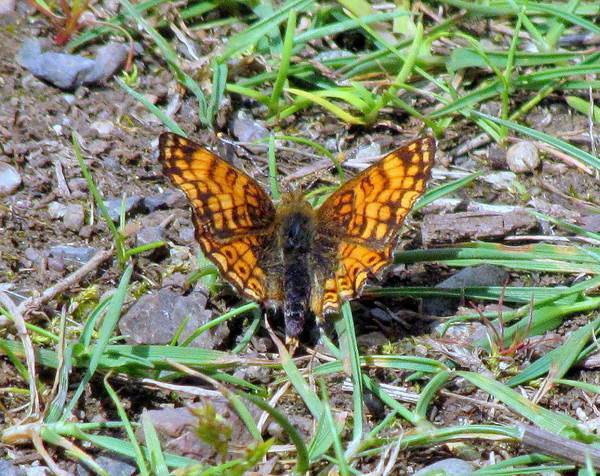 Jeremy Tatum reports a Satyr Comma from Blenkinsop Lake on May 12. 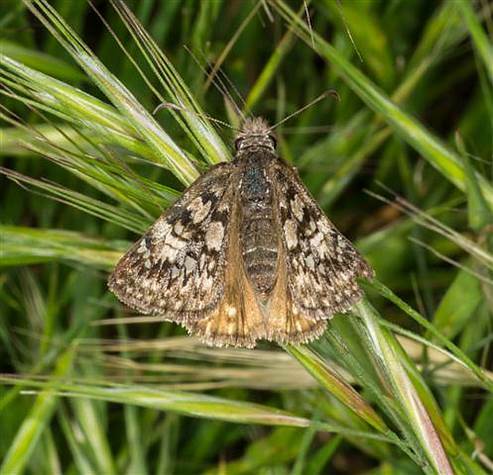 Rosemary Jorna reports a few Mourning Cloaks, and more Western Spring Azures were flying along the road in Scout Camp Bernard on May 12. Then in front of the Archery Range there were 25 to 30 fresh Western Spring Azures mud puddling. 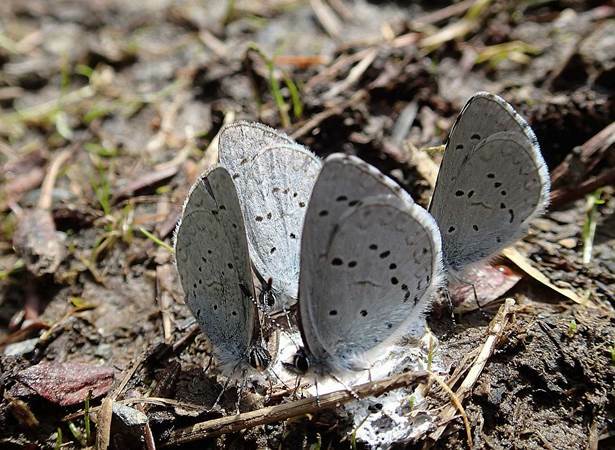 She sends a photo of a few of the mud-puddlers, and a close-up of a Western Spring Azure, as well as the millipede Harpaphe haydeniana. Jeremy Tatum also shows two geometrid caterpillars from Physocarpus at Maber Flats, May 13. 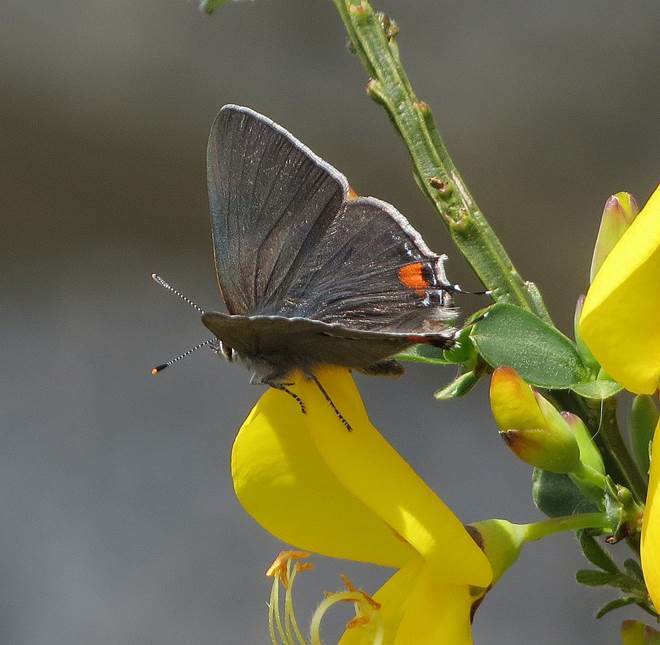 Jeff Gaskin writes (May 12): Just to let you know that up to five Silvery Blues are amongst the lupines at the Colwood exit of the Island Highway. The lupines are just starting to flower now and the blues are very busy flying around the flowers. 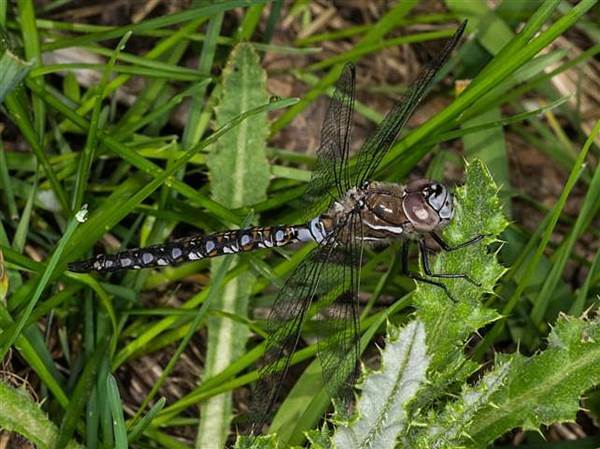 Ken Vaughan sends a batch of various insects and a spider from Beaver Lake Ponds, May 11. 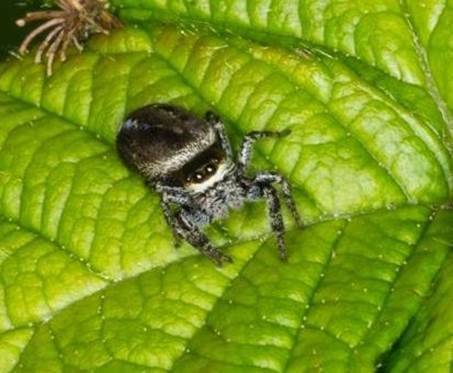 The first is a jumping spider of the family Salticidae. This is a large family with many similar species, and it would probably be unsafe to give it a name here. Next is a march fly. Next is a bee. 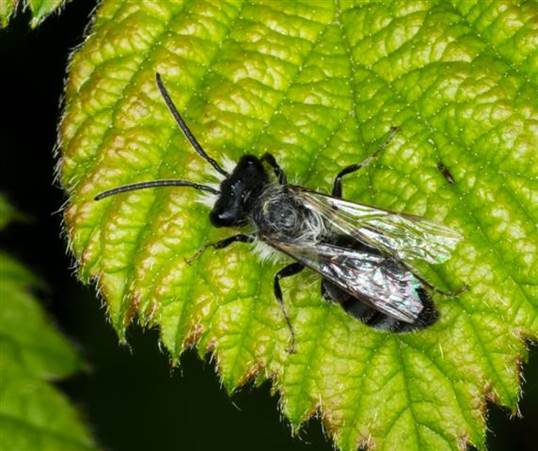 A tentative suggestion is that it might be Eucera sp. 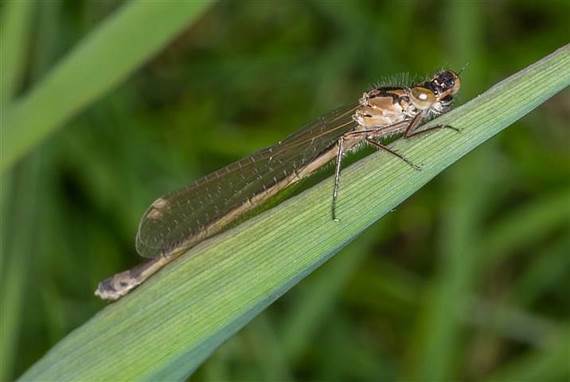 And finally a damselfly. 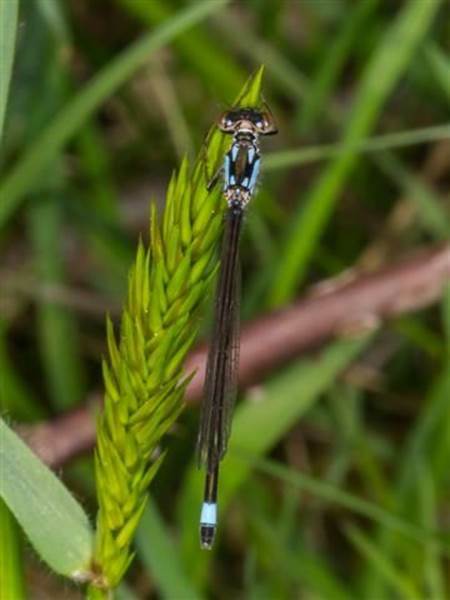 Rob Cannings writes: This is a female Ischnura cervula, I believe. 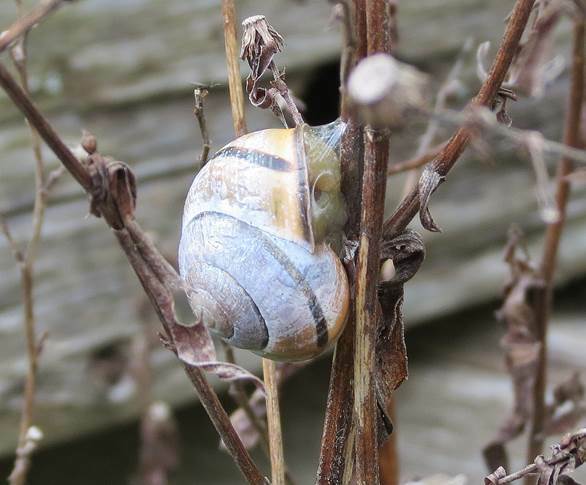 A blue form, but not one of those with the male-type, broken antehumeral stripes. 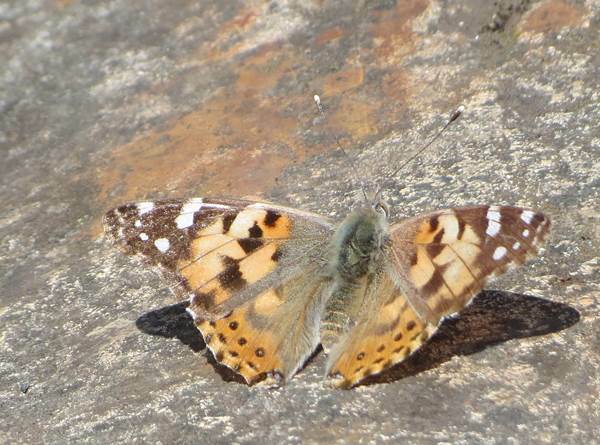 Val George photographed a Painted Lady on Mount Tolmie on May 9. It and a Mourning Cloak were still there on May 11. 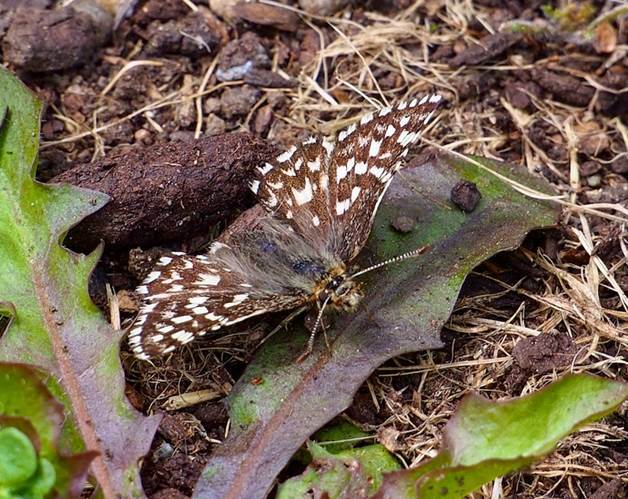 Jeremy Tatum and Bill Savale visited Latoria Creek Park on May 11, and found a little glade with lots of butterflies – Sara Orangetips, Cabbage Whites, Satyr Commas, Western Spring Azures, and maybe ten or more Mourning Cloaks. 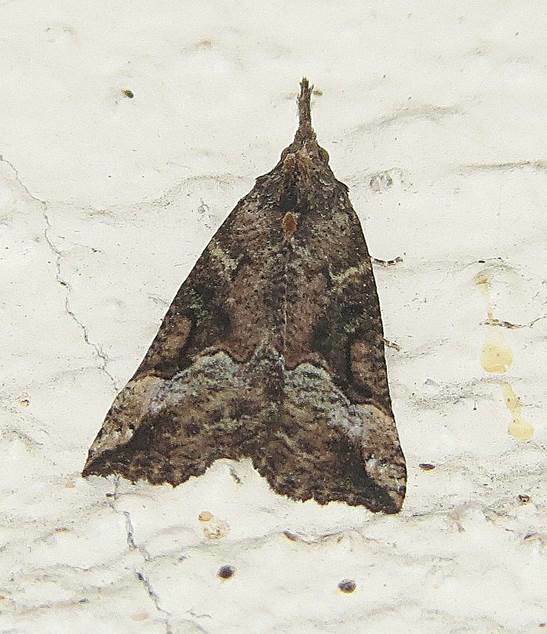 We also found there the geometrid moth Spargania luctuata. 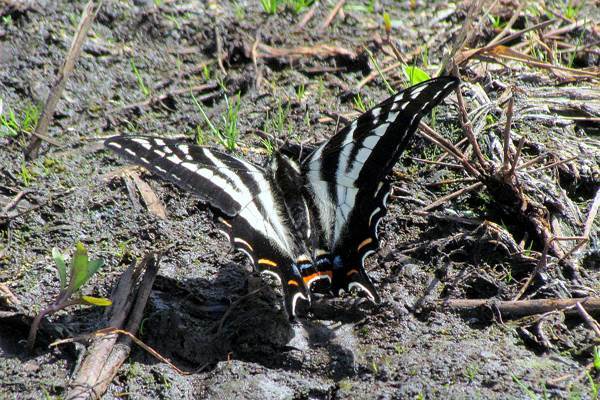 Gerry and Wendy Ansell saw their first Western Tiger Swallowtail of the year on May 11, in Thetis Lake Regional Park. Jeremy Tatum wonders: Have the Painted Ladies flown in from somewhere, or did they overwinter here? Val’s specimen is evidently a very fresh specimen, while Bill’s is worn. What can we deduce from that – if anything? Painted Lady Vanessa cardui (Lep. :Nymphalidae) Bill Katz. Grey Hairstreak Strymon melinus (Lep. 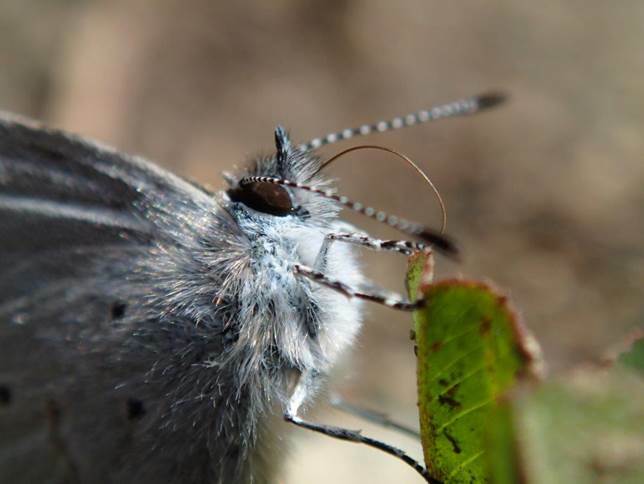 :Lycaenidae) Bill Katz. 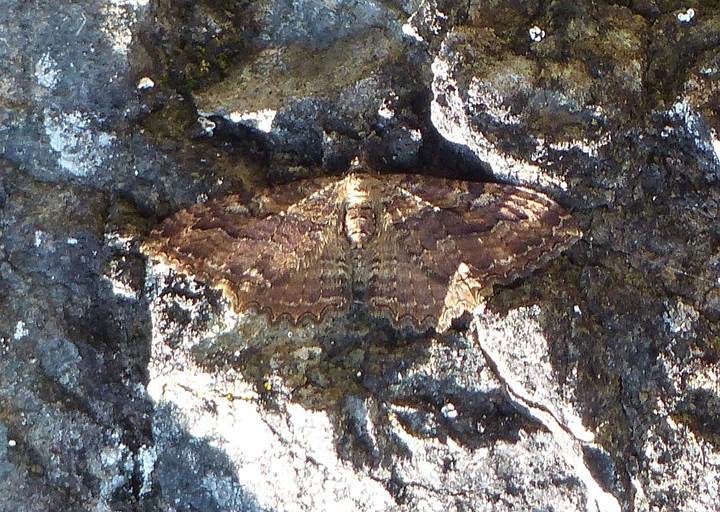 Ian Cruickshank sends photos of two moths from Mount McDonald (Sooke Hills), May 8. 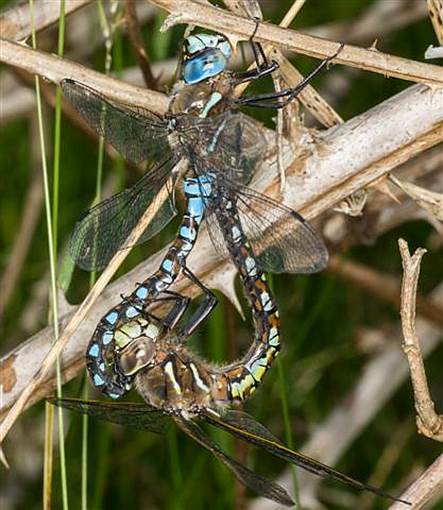 One of them is Melanolophia imitata. 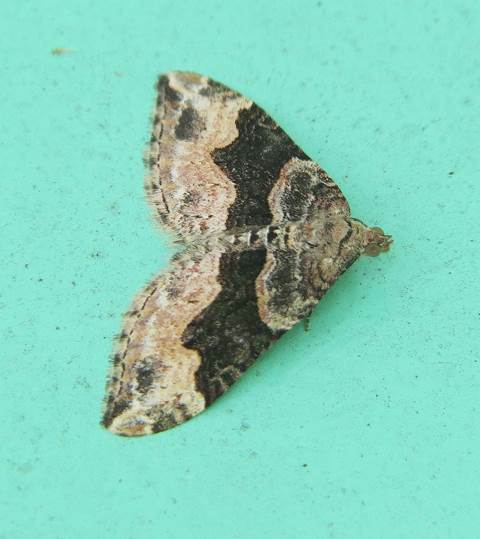 The other is a highflier of the genus Hydriomena. 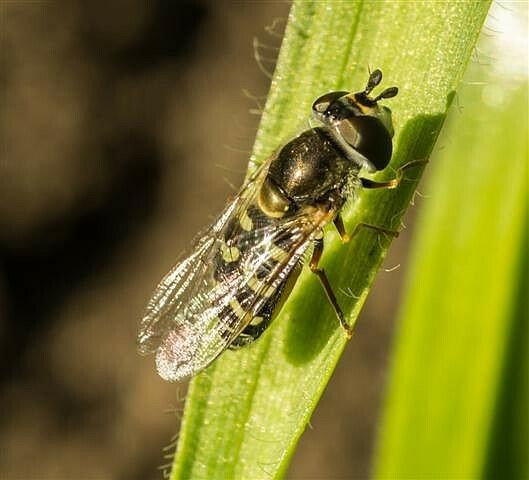 Jeremy Tatum writes that he is not certain of the species (there are many! 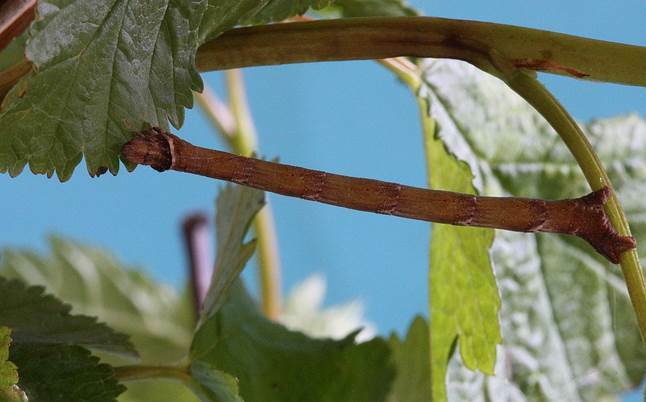 ), but it is most likely H. furcata or perhaps H. edentata. 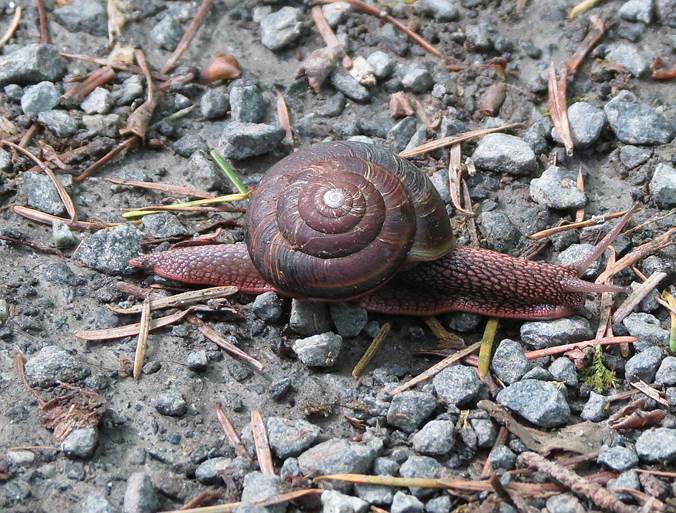 Bill Katz sends a photo of the moth Xanthorhoe defensaria and the snail Monadenia fidelis (known variously as the Faithful Snail or the Pacific Sideband) from Goldstream Park, and the snail Cepaea nemoralis from Finnerty Gardens, May 10. 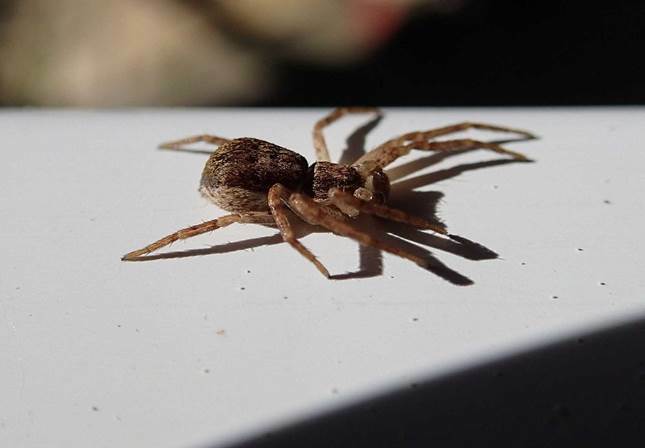 Rosemary Jorna photographed two spiders on her deck at Otter Point on May 7. 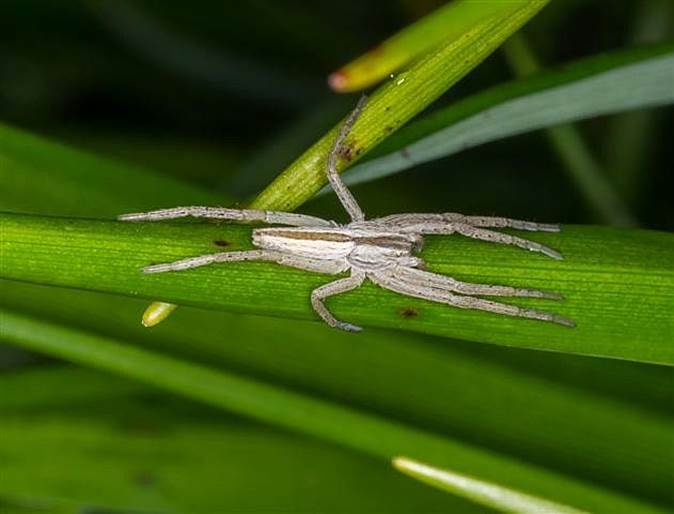 #1 is an immature male anyphaenid “ghost spider” – Anyphaena sp. 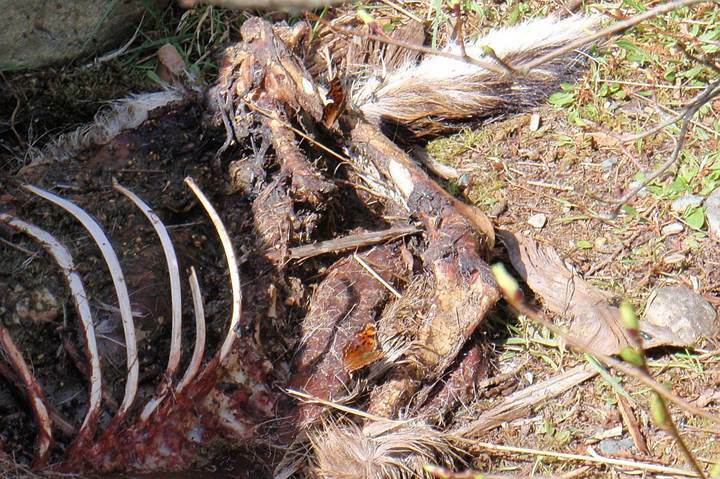 Hunting, primarily nocturnal spiders; two species are fairly common in BC. 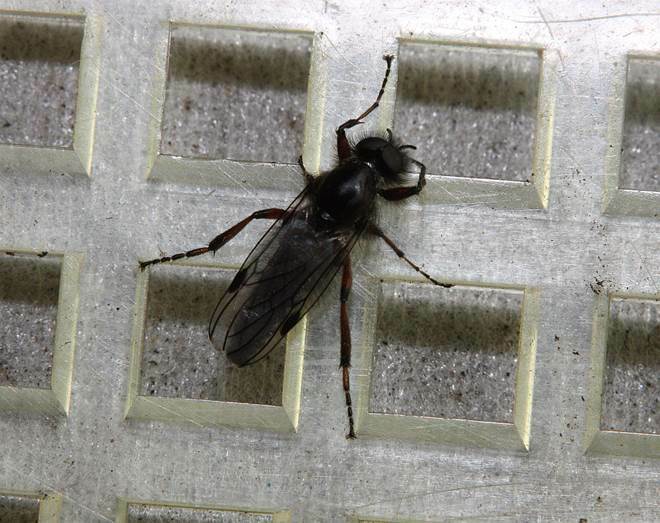 Anyphaena aperta (a west coast endemic) is the most likely identification in our area, but A. pacifica is also around. Folks don’t often notice these spiders because they are relatively small, cryptic, and most active at night. 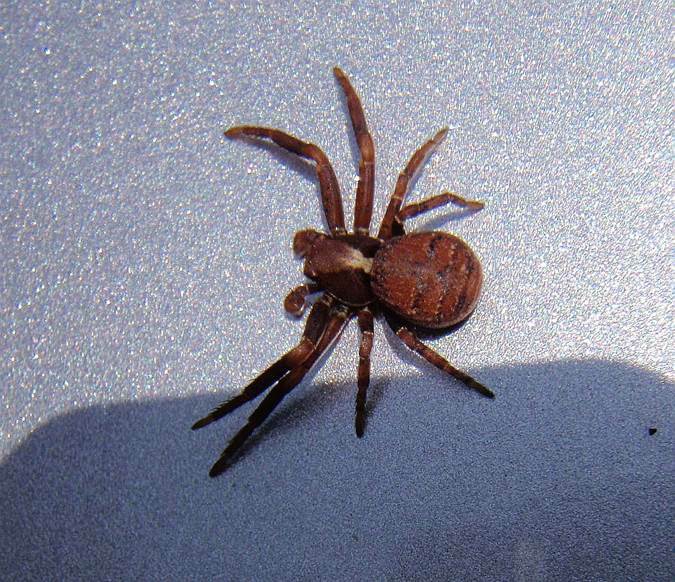 #2 is a male philodromid “agile crab spider**” – Philodromus dispar. 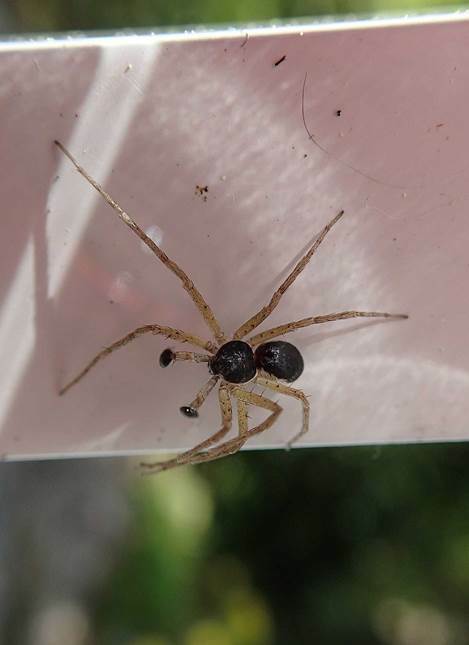 Males of the species are very common in/around homes this time of year – a Palaearctic species introduced to the west coast [and one of the only species of Philodromus (a very large genus) that is easy to eyeball to species]. **also known by some authors as “running crab spiders”. Notice to contributors. As we noted in an earlier posting (March 24) it generally takes up to three or four days between when we receive a contribution and when we manage to post it. This usually works out well. 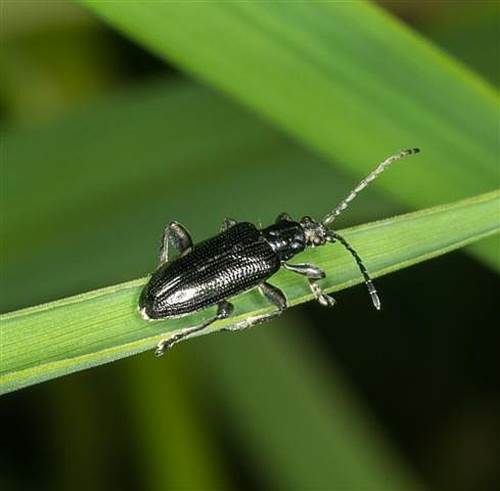 However, occasionally there is a report of some special invertebrate (a rarity, perhaps, or a first sighting of the season) and people would like to dash out and see if they could see it, in a similar manner to a report of a rare bird. In such cases (a “chaseable” invertebrate) we shall make a special effort to get the report posted as soon as we can after it is received. Let us know if you feel that a report that you send in possibly comes into this category, and we’ll do our best! 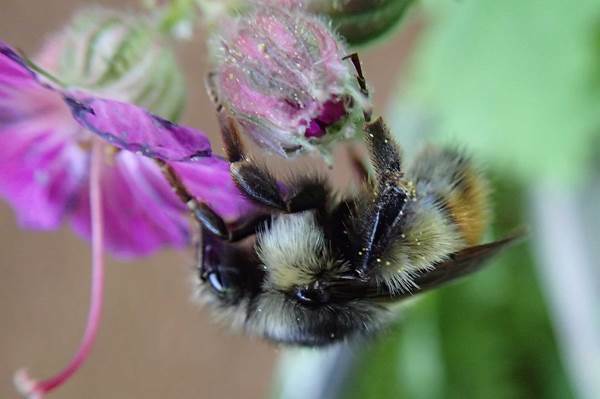 Rosemary Jorna sends photos of bumblebee and a beetle (possible a weevil) from her deck at Otter Point, May 7. I hope someone can identify them for us. Jeremy Tatum reports a Mourning Cloak from the reservoir on top of Mount Tolmie, May 6. It may well hang around for a while. 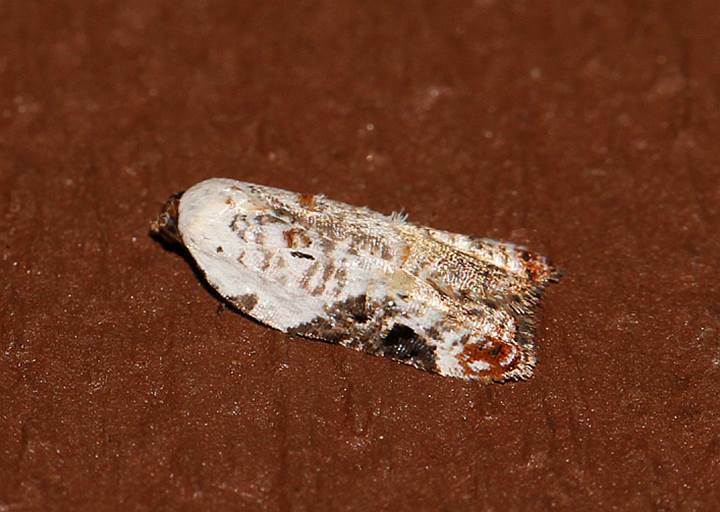 Jeff Gaskin reports a Green Comma from Hector Road, May 7. He had a good look at it when it settled and was able to identify it with certainty. 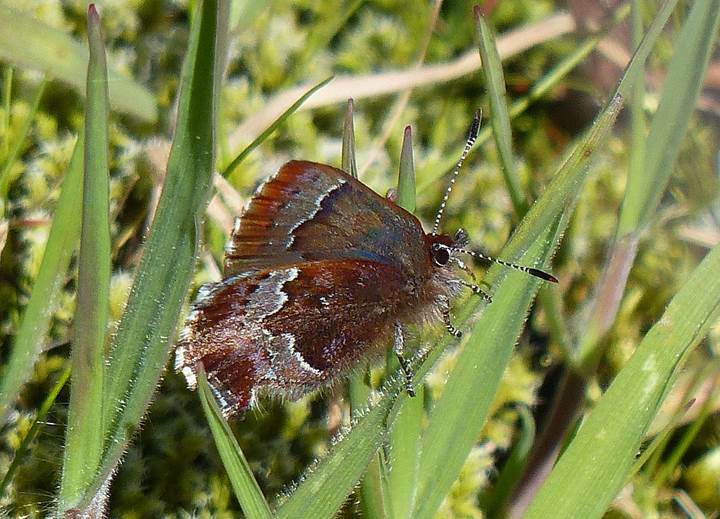 And Gerry Ansell reports a Grey Hairstreak and a Propertius Duskywing at the summit of Lone Tree Hill, May 7. 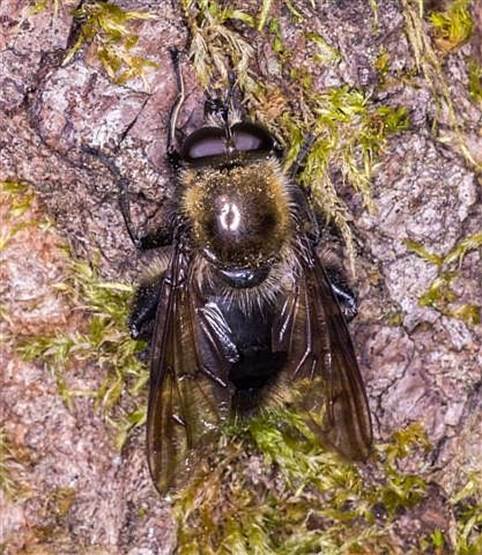 Here are some recent insects from Mount Tolmie, photographed on May 4 by Ken Vaughan. We don’t always know the names of the animals shown on this site, so, if there are any viewers out there who can help with identifications, please do let us know. 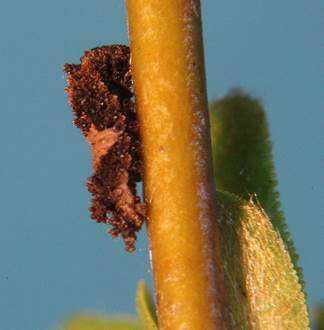 Ken’s first is a young caterpillar of Erannis vancouverensis (which I suspect might actually be European E. defoliaria) on apple. 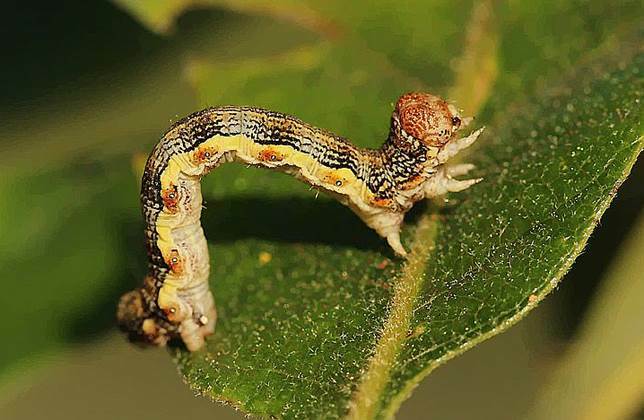 In a couple of weeks we’ll be seeing hundreds of the full-grown version of this caterpillar, on many trees, but especially on oaks. 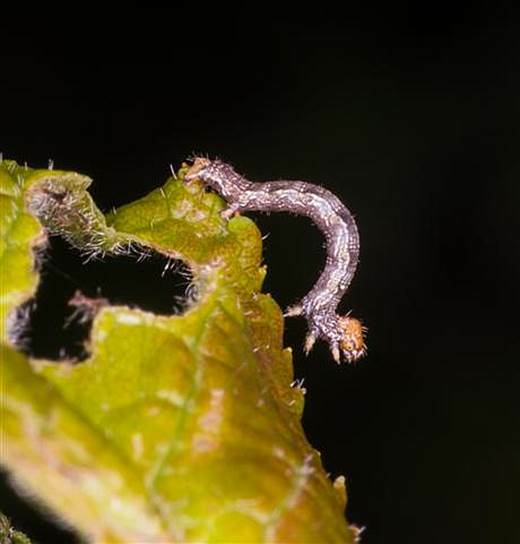 How can I identify such a young caterpillar? The way it is menacingly holding its head and thoracic legs is quite characteristic of the species. 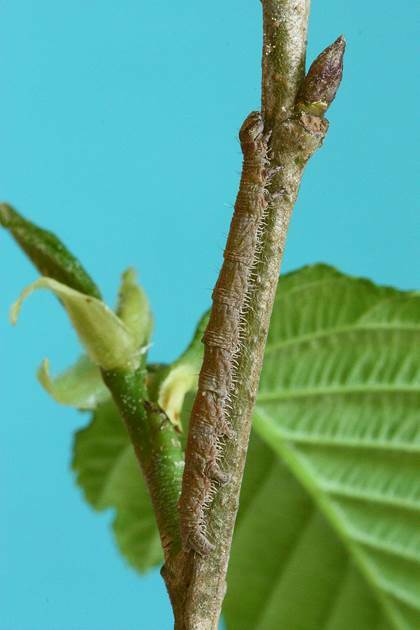 Ken’s second photo was of a micro caterpillar on the same apple tree. Probably a tortricid. Ken’s next two are flies. I’d really like to know what the first one is. 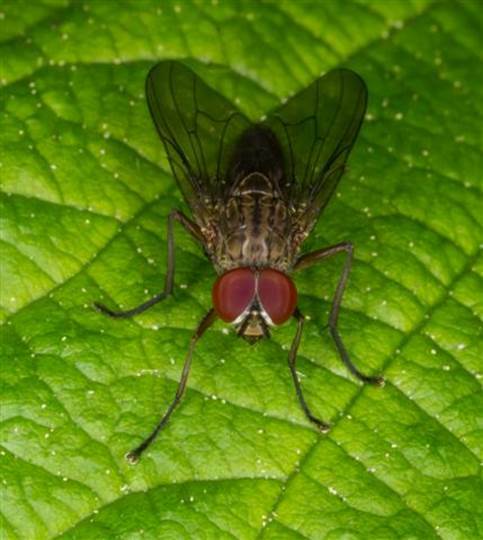 When you walk along a trail with a hedge on either side, there are always numbers of this red-eyed fly on the shrubs on either side of the trail, and they are always (or so it seems) facing into the trail, as if they are watching you. Can anyone identify either of these flies for us?? Next, a snakefly. 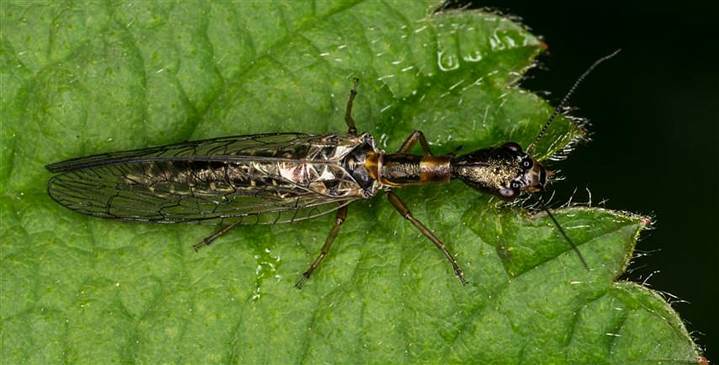 Formerly part of the Neuroptera, snakeflies now have an order of their own, the Raphidioptera. Ken’s last is obviously a bee, but I don’t know which. 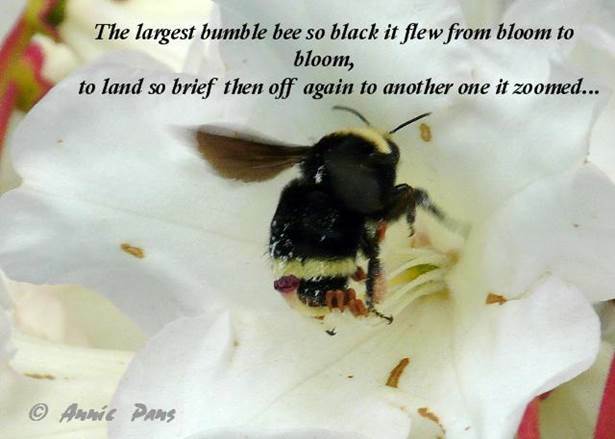 Ken suggests a “digger bee” (Anthophorinae), but it’ll need an expert to help us. 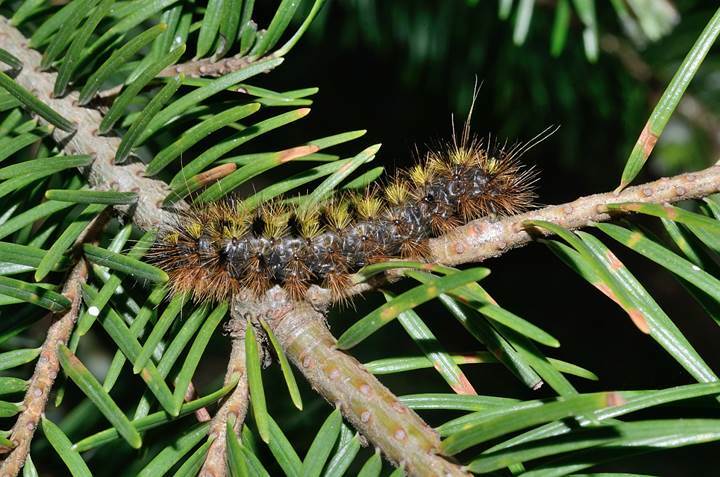 Bruce Whittington sends a photo of a caterpillar of the Silver-spotted Tiger Moth from Ladysmith. from the gardens of Government House, May 2. 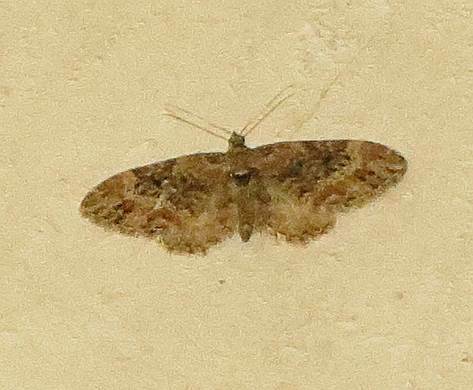 On May 3, Bill Katz found a Euthyatira pudens On the wall of the UVic Interfaith Chapel. 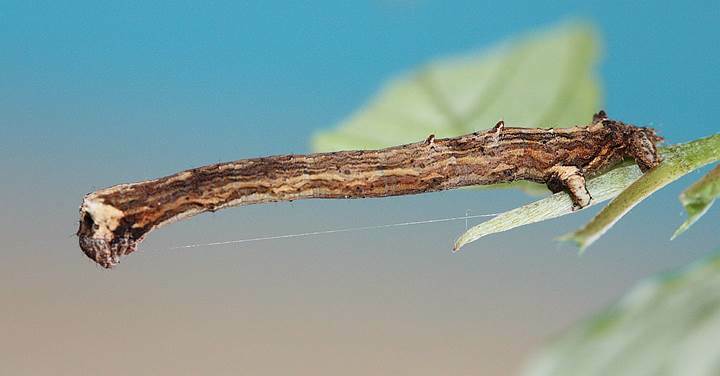 Its caterpillar feeds on Cornus stonolifera. 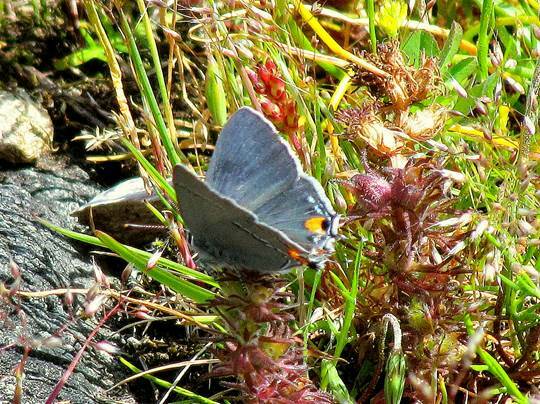 He also sends a photo of a female Western Spring Azure from Summit Hill. 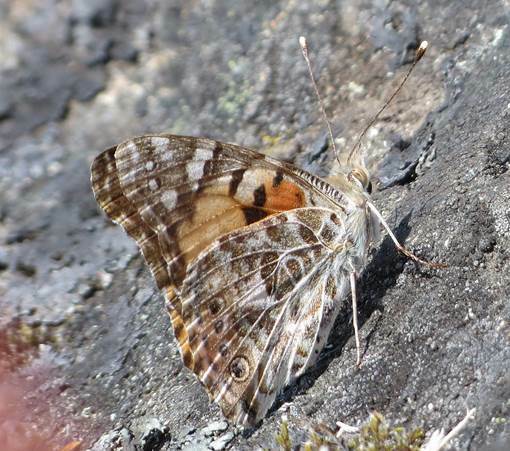 Jeff Gaskin reports a Painted Lady near the summit of Mount Tolmie, May 2. Jeremy Tatum reports a Mourning Cloak on Mount Tolmie and another one at his Poplar Avenue apartment, May 1. 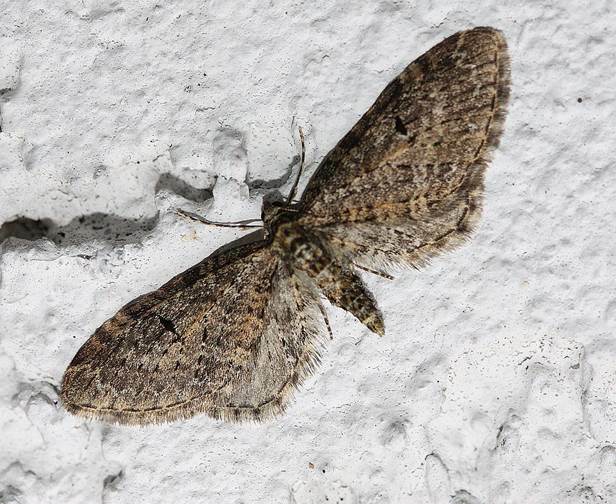 He photographed two moths from the Lochside trail north of Blenkinsop Lake, May 1. 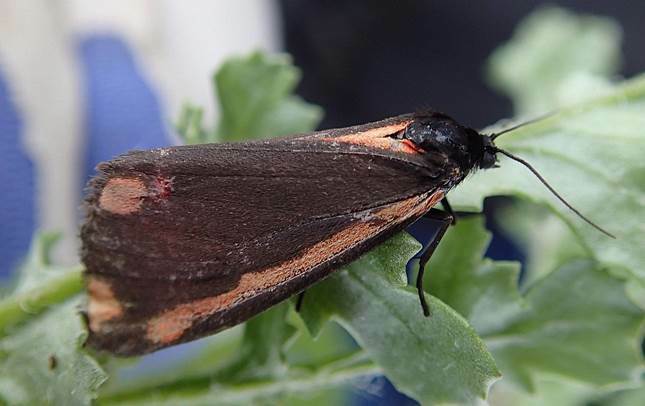 Ken Vaughan writes: I took a quick walk after work around Swan Lake on May 1, and didn’t find much of interest, with one exception – a moth with feathers for wings. 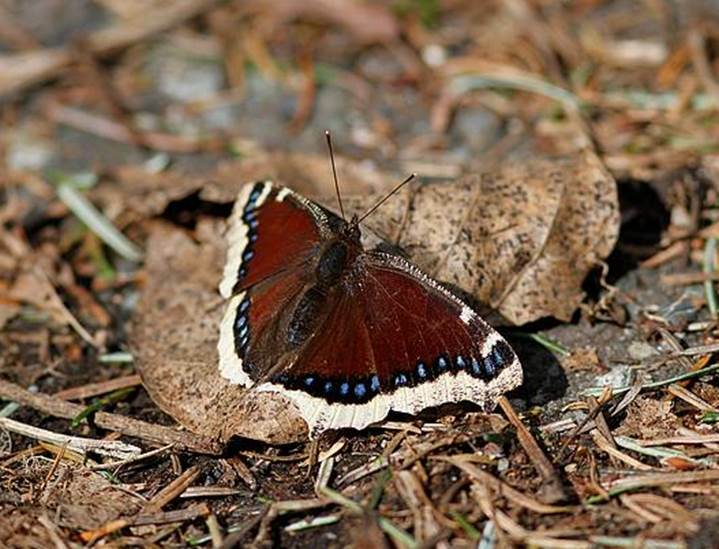 Several April 30 butterfly sightings: Jeremy Tatum reports that he saw a Mourning Cloak at UVic. Jeff Gaskin reports that while hiking the Lochside trail from Borden Street to Lohbrunner he found one Mourning Cloak and one Satyr Comma. He saw another Mourning Cloak at a rather unusual location – at the corner of Oak Street and Saanich Street which is right by Wal Mart. 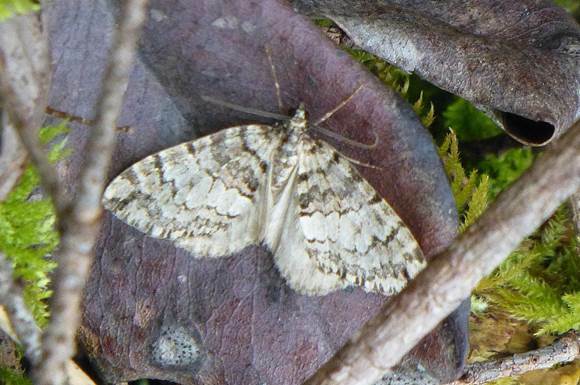 Val George reports the following from Observatory Hill (Little Saanich Mountain): 5 Propertius Duskywings, at least 10 Sara Orangetips, 1 Cabbage White. 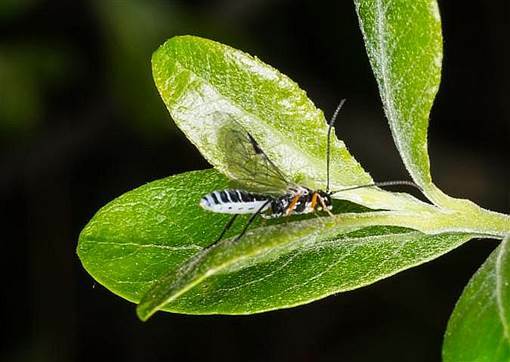 Ken Vaughan sends some photos from the retreiver ponds at Beaver Lake, April 29.
genus level.” Can anyone help with the wasp, the beetle and the crane fly? 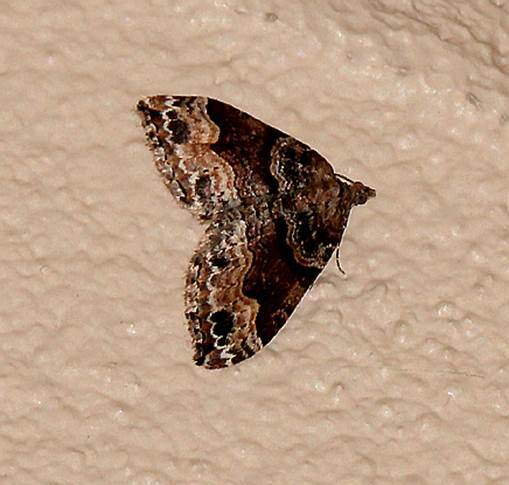 Val George writes: Here is a photo of a Propertius Duskywing I took today, April 28, at Mt Douglas. 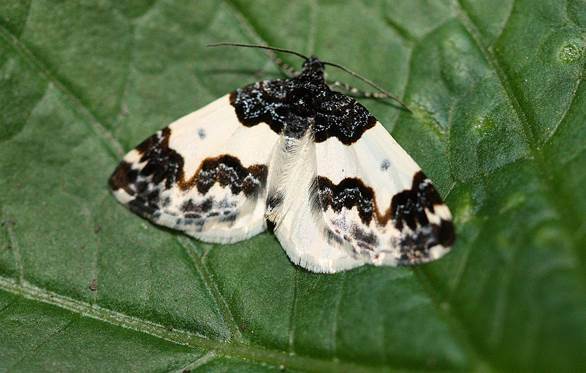 Also there were: 3 Spring Azures, c5 Sara Orangetips, 1 Cabbage White. 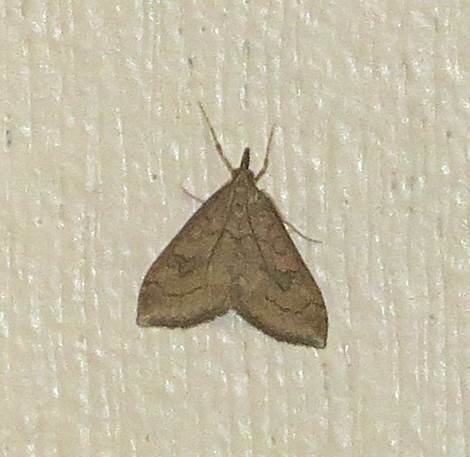 I also got this shot of the moth Cissusa indiscreta. 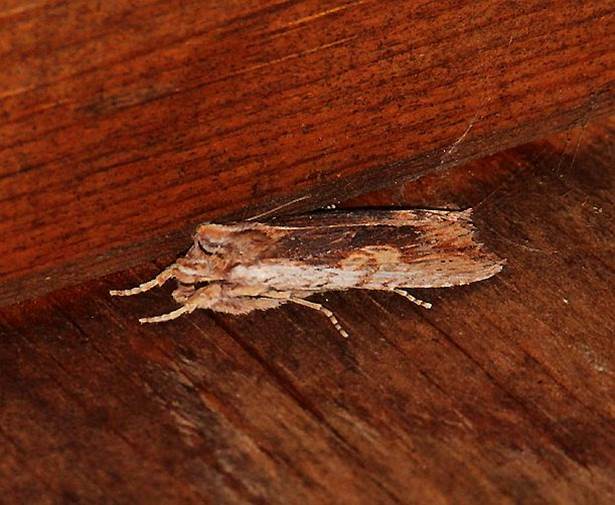 Bill Katz writes: Some moths have finally returned to the garage. This morning (April 29) there were five Alucita montana (Montana Six Plume Moth) in one corner of the garage and on another wall was the first Xanthorhoe defensaria I’ve seen on Summit Hill. 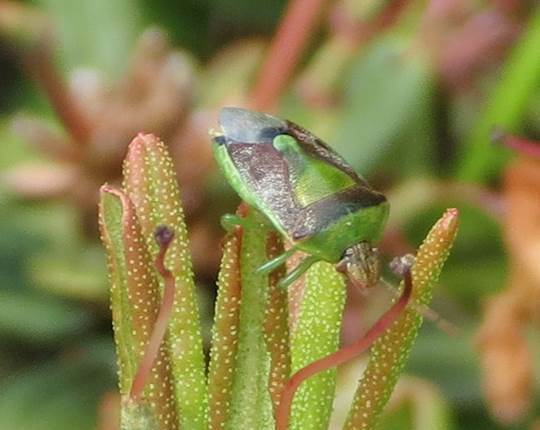 Spring Azures, Cabbage Whites and Brown Elfins were in the garden in the afternoon plus a green and brown bug (photo attached). 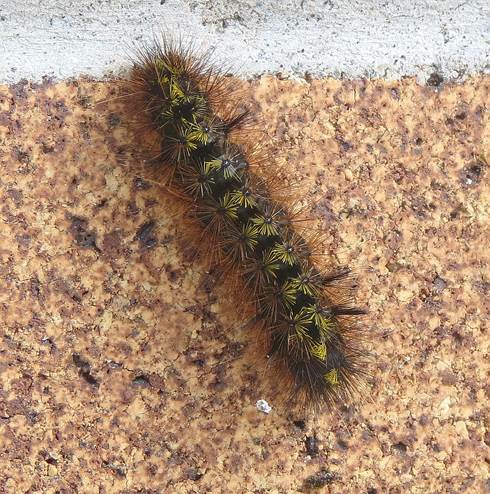 A caterpillar (photo attached) of the Silver-spotted Tiger Moth Lophocampa argentata was on the brick wall of the pool house. Marie O’Shaughnessy photographed a Western Spring Azureat Ten-mile Point on April 23. 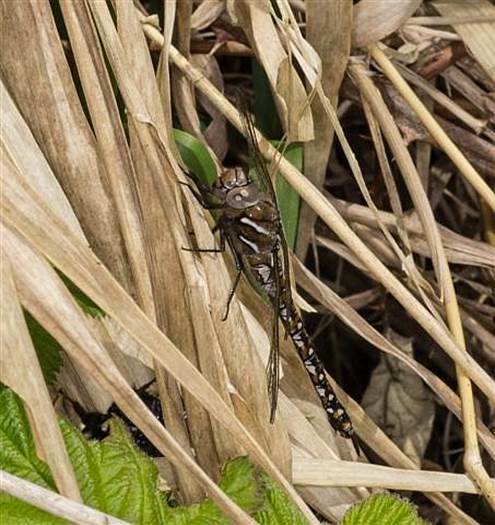 Ken Vaughan writes: I was out to Swan Lake this morning (April 28), and found my first true dragonflies. 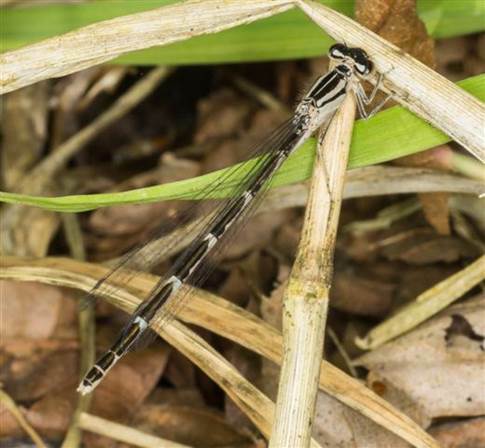 I saw two male California Darners. 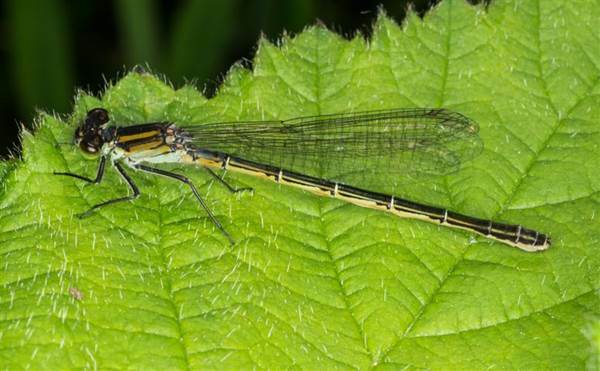 Also included is a female Pacific Forktail. Jeremy Tatum shows a caterpillar of Campaea perlata from an alder at UVic, April 28. Jeremy Tatum reports a Mourning Cloak from Munn Road, April 26. 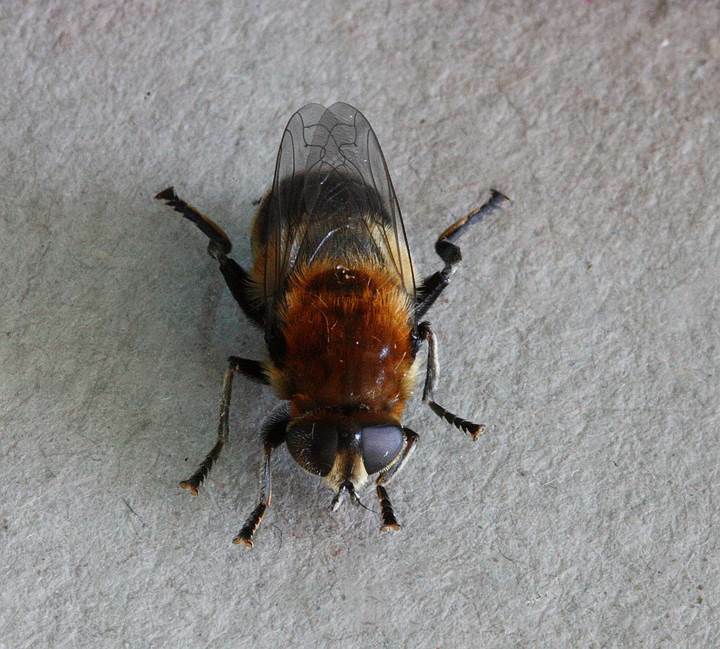 Rather less welcome the following day was a Bluebottle Fly Calliphora vomitoriain his kitchen. Bill Katz writes: I was treated to a marvellous view of a backlit Western Brown Elfin in our garden on Summit Hill this afternoon (April 25). Diffraction gave it a striking blue or green edge which I haven’t seen before. The other photo is a Cabbage White in a tapestry of flowers. The butterfly image is relatively small but I wanted to share the shot. Two common butterflies; two glorious moments. 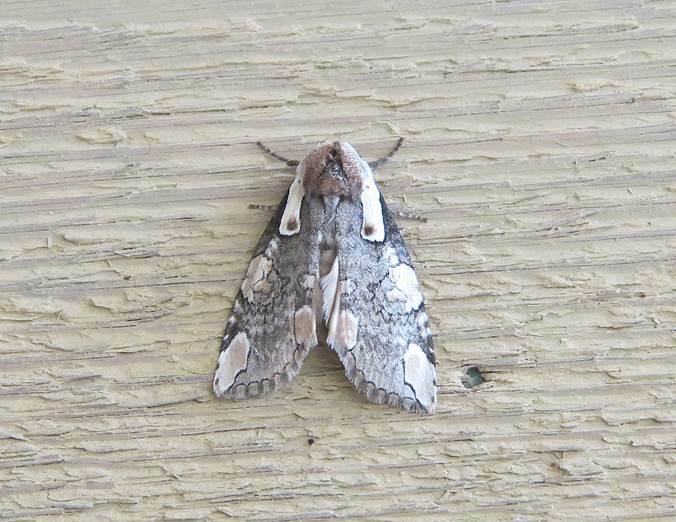 Bill also sends a photograph of the moth Nola minna from Goldstream Park, April 27. 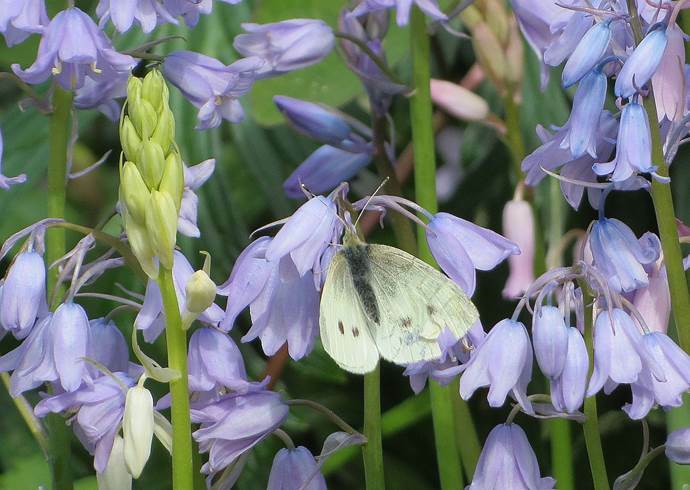 Jeremy Tatum comments: The flowers are, of course, the introduced European Bluebell Hyacinthoides nonscripta. 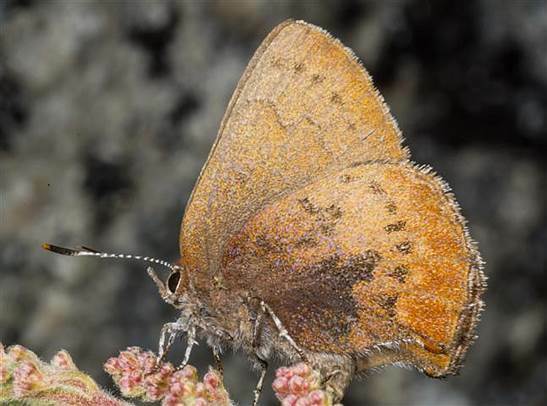 An introduced European butterfly on an introduced European plant. But one can’t deny that it’s a beautiful picture! 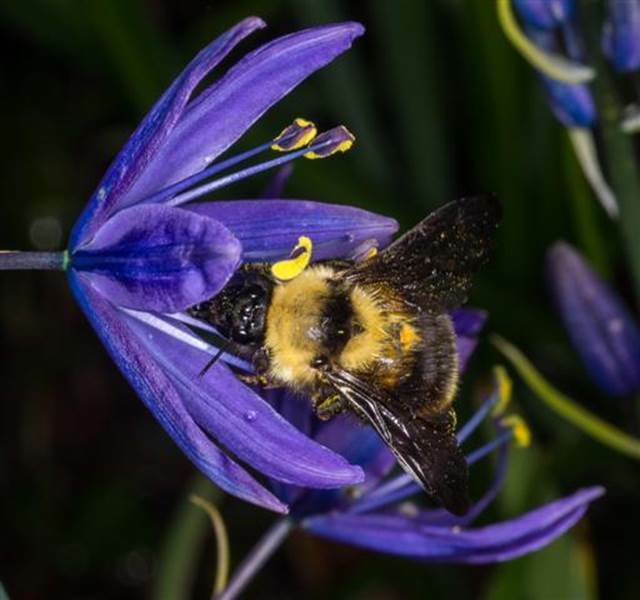 Annie Pang sends poetograms of a bee and a butterfly from Gorge Park, April 27. 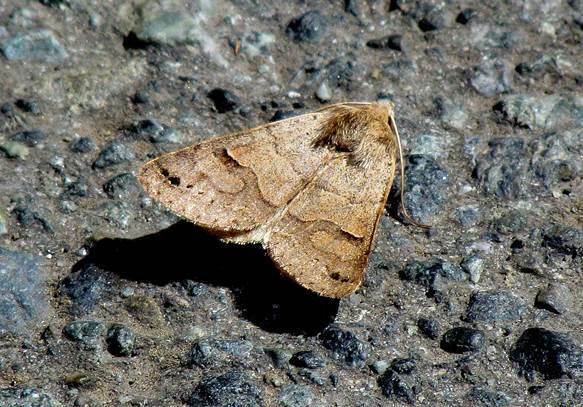 Jeff Gaskin writes: On Tuesday, April 22, along the Lochside trail north and south of Blenkinsop Lake there were four Western Spring Azures and that was all. At Swan Lake also on Tuesday, by the Tuesday Pond were four Satyr Commas, and 1 Mourning Cloak. Three Western Spring Azures were by the nature house and near the parking lot. 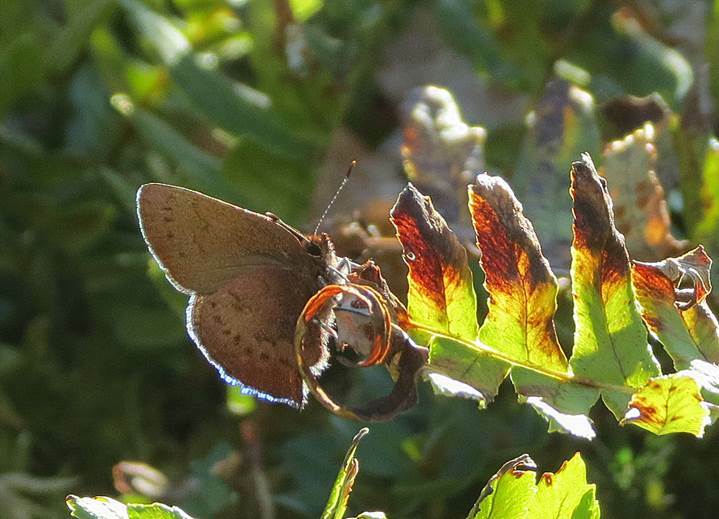 Finally one Mourning Cloak, and one Western Spring Azure were near the lollipop wharf in front of the nature house. 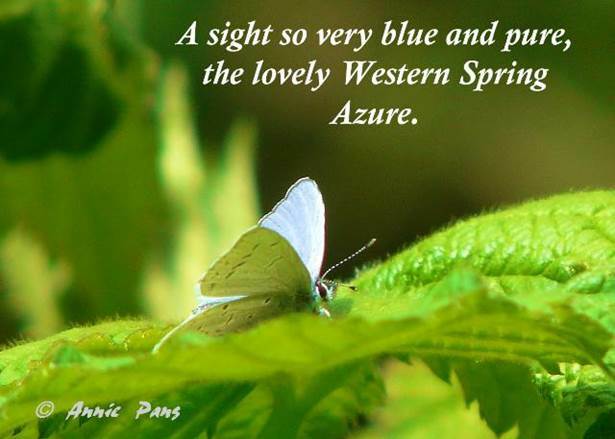 Annie Pang saw a Western Spring Azure at Gorge Park on the same date, but she writes: “it didn’t land – so no pictures”! Ken Vaughan sends some photos from Swan Lake, April 23. 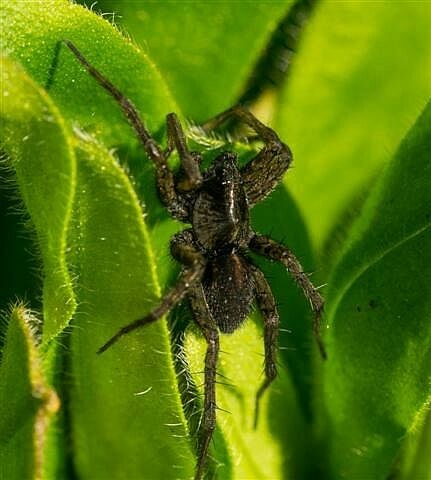 Thanks to Robb Bennett for the identification of the spider. 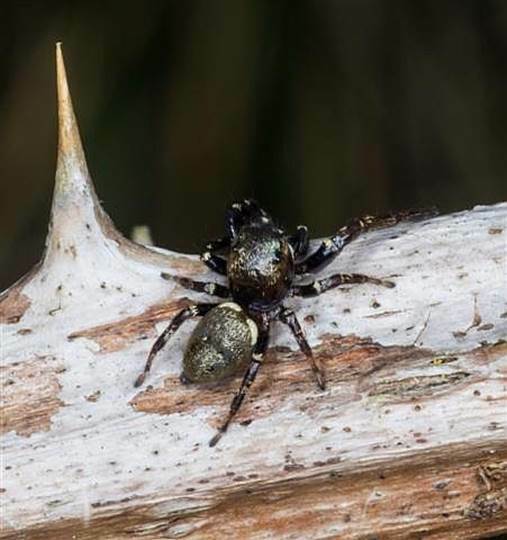 Robb writes: “The beast is a philodromid crab spider. 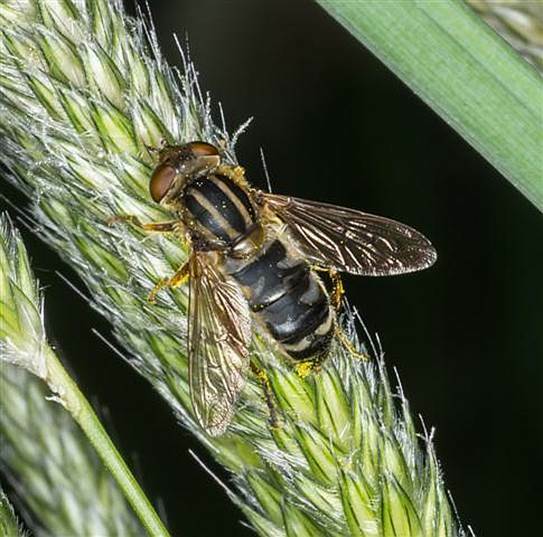 A species of Tibellus; almost certainly T. oblongus, which is very common in BC, especially here on the coast.” I wonder if anyone can identify the flies for us? 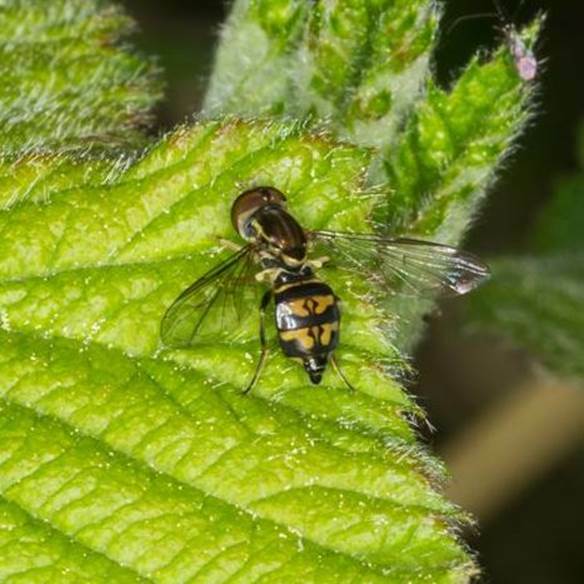 The first of Ken’s flies looks as though it might be the same species as Rosemary Jorna’s fly on the April 20 posting. Bill Katz shows a Triphosa haesitatafrom Goldstream and a Behrensia conchiformis from Haro Road, April 11. The caterpillar of the first feeds on Cascara, and that of the second on Snowberry. The green reflections from the wings of Behrensia conchiformis fairly scintillate in strong sunlight. Not sure what selective advantage this has, but it must have some! 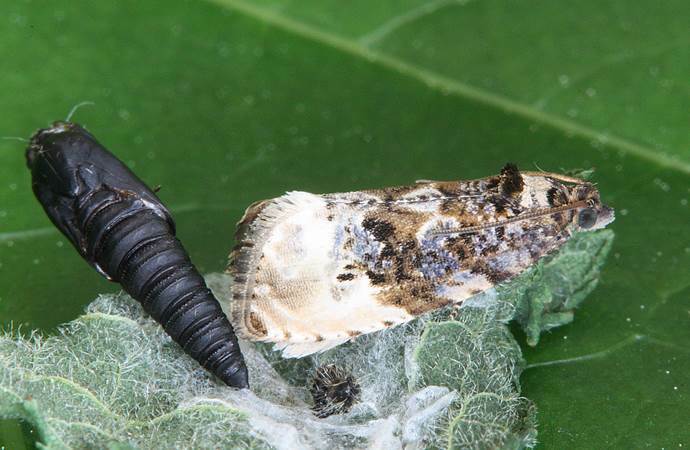 Jeremy Tatum writes: It seems a bit early in the year to start talking about Lorquin’s Admiral, but on April 9 I couldn’t help noticing, on a willow twig at Blenkinsop Lake, a little hibernaculum – the small folded leaf inside which the first-instar caterpillar of Lorquin’s Admiral spends the winter. The hibernaculum was empty, but, sure enough, I spotted the tiny caterpillar a few inches away on the twig. More to be expected at this time of the year is the familiar day-flying moth Mesoleuca gratulata, also found at Blenkinsop Lake on April 9. 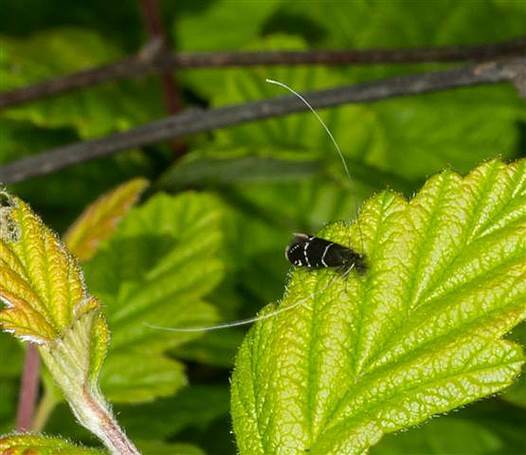 Its caterpillar feeds on Rubus species. 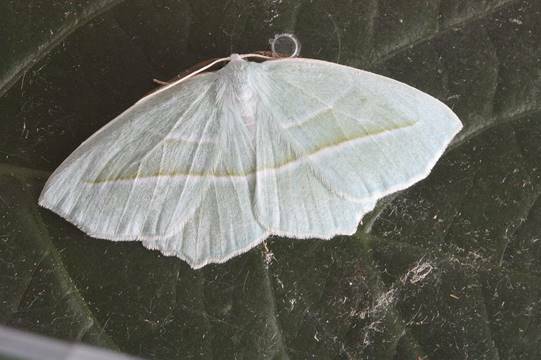 Bill Katz has noted several butterflies at Swan Lake and Summit Hill in the last few days – Mourning Cloaks, Western Spring Azures, Western Brown Elfins and Cabbage Whites. Gerry and Wendy Ansell and Jeremy Tatum report a few Cabbage Whites and a Sara Orangetip from Swan Lake, April 7. Val George reports a Western Tiger Swallowtail and two Cabbage Whites near the Royal British Columbia Museum, also on April 7. 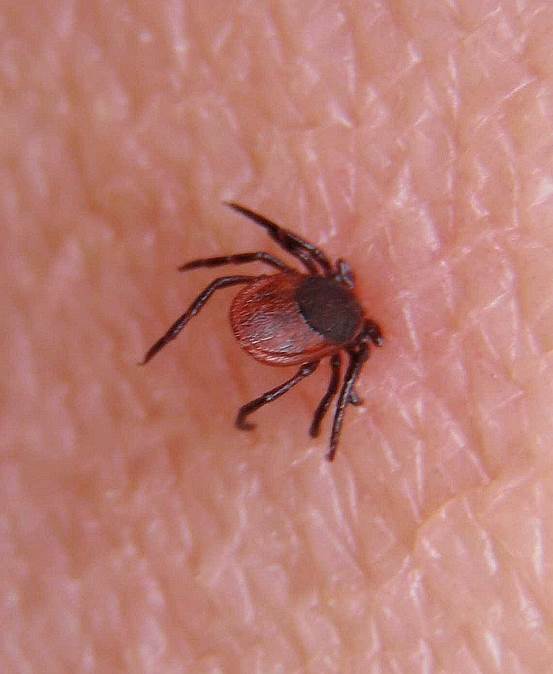 Rosemary Jorna writes: Ticks are out — they found us on both Mt Bluff above Scout Camp Bernard on April 5, and in the Blue Green Belt today. The photo of the tick was taken just before its removal, done during the hike Saturday April 5, 2014 Another was found wandering around another hiker earlier today April 7, 2014. We had been on Flower Ridge. Comma butterflies were active on 2 sunny slopes on flower ridge but moving too fast to photograph. The deer carcass behind the rock at the parking lot in Sooke Potholes Provincial Park April 7) kept two commas [Green Commas, I think – Jeremy Tatum] still enough to catch a photo but still too wary for a close up. A Mourning Cloak was also attracted to the deer but did not settle. The photo is of the Mourning Cloak in the Barnes Station parking lot of the Sooke Potholes Regional Park (April 7 The spider was on the car in the Sooke Potholes Provincial Park lot April 7. 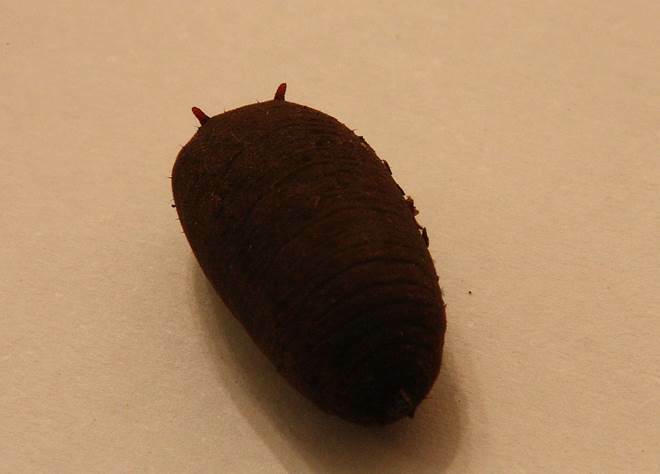 Robb Bennett says that the tick looks a bit like a female of Ixodes pacificus, but he’d need to see the animal and examine it closely to be sure. what species. 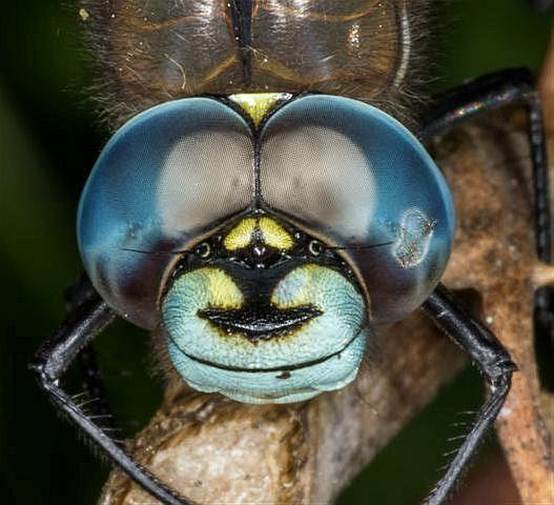 Looks like an immature male. 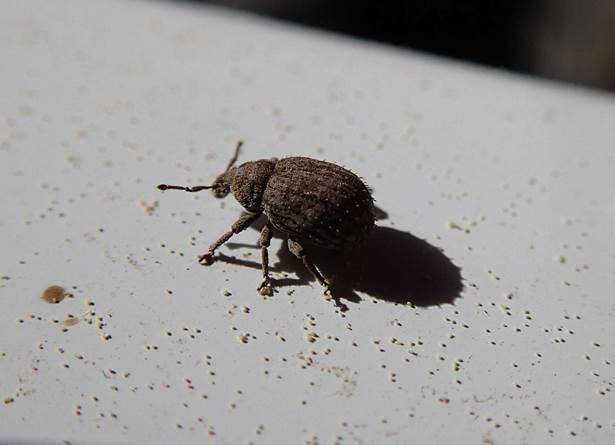 Jeremy Tatum writes: Here is another Egira curialisfrom my Saanich apartment. 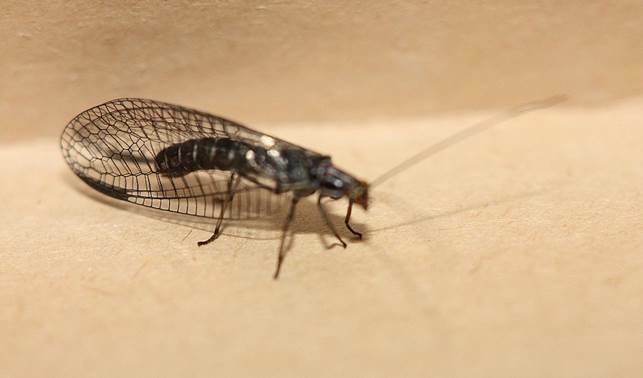 Also a lacewing.- thanks to Claudia Copley for identifying it for us. 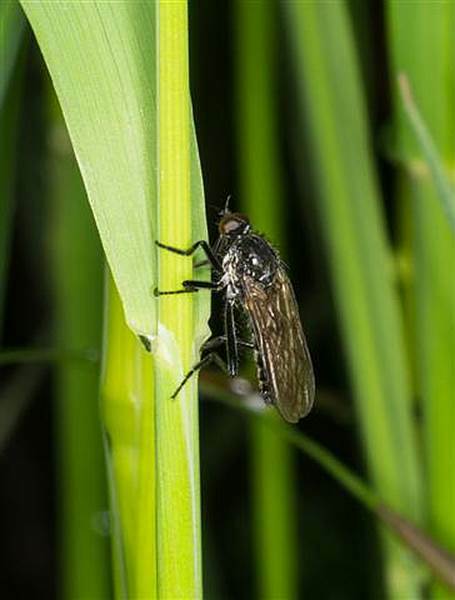 Jeremy Tatum writes: The rather conspicuous hairy black flies with dangling dark reddish legs that we see flying around sluggishly in April and May and which occasionally collide with us are bibionid flies. One landed on my Saanich balcony on April 7 asking to be photographed. 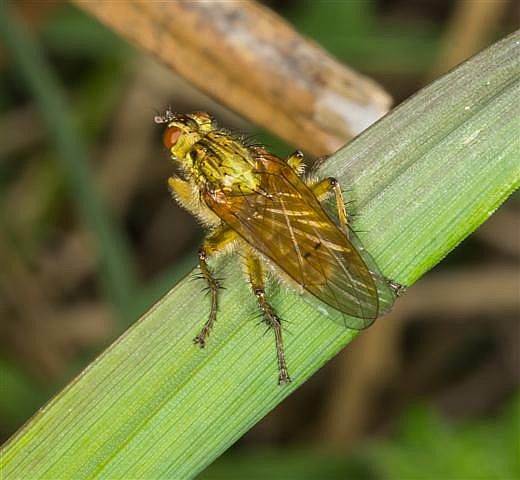 They are often quite inappropriately called “March” flies. This is inappropriate not only because in Victoria they are more likely to be seen in April and May, but more importantly for the following reason. 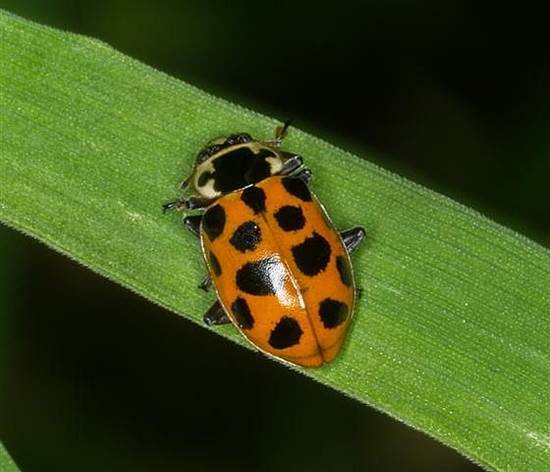 The most familiar European species was named by Linnaeus Bibio marci. 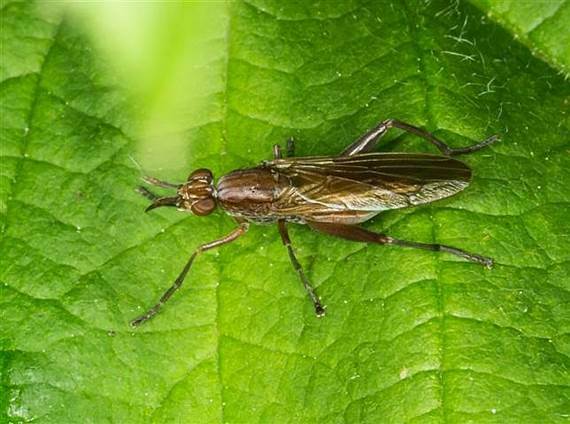 The name marci has nothing to do with the month of March, but it refers to Saint Mark, since the flies traditionally first appear near to St Marks’ Day, April 25, and the flies are more properly called St Marks’ flies. 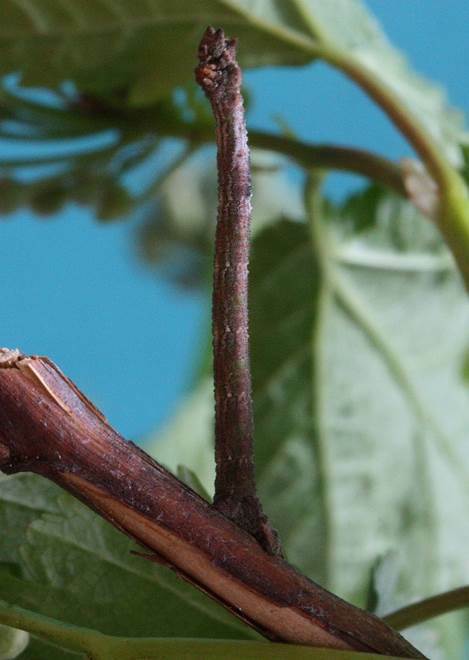 The forward-pointing apical spur at the end of the foreleg tibia distinguishes flies of the genus Bibio from similar genera in the family Bibionidae. Can anyone identify for us the species shown below? Here are two pugs, one photographed by Jeremy Tatum in Saanich on April 7, the other photographed by Jeremy Gatten in Metchosin on April 5. 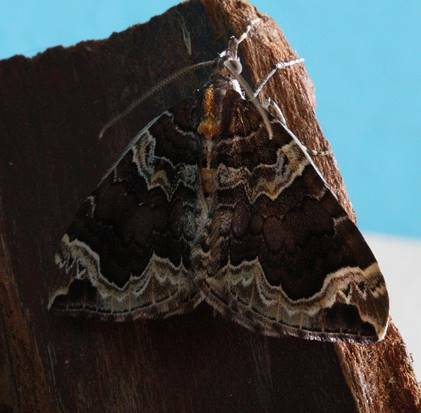 Jeremy Gatten also sends some moths and a beetle from Colwood and Metchosin on April 5. 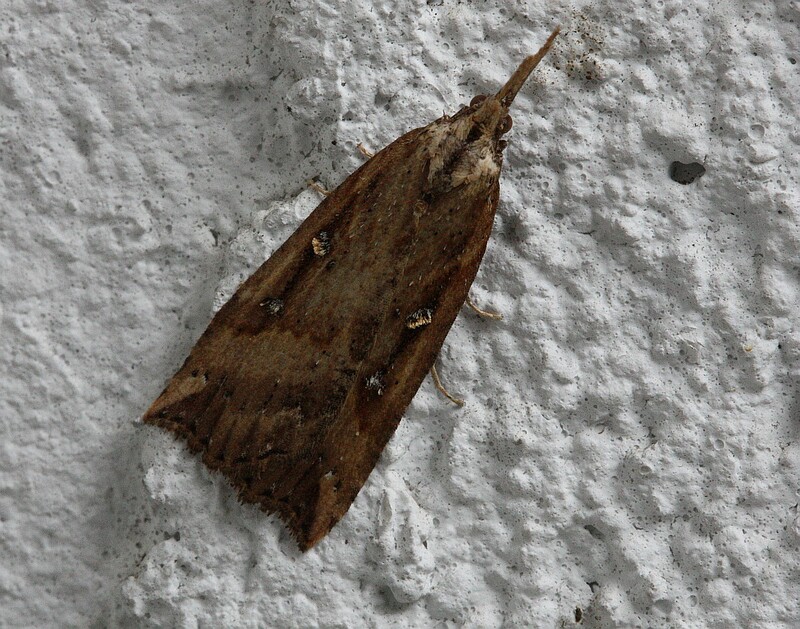 Bill Katz sends a photograph of Hypena decorata from the Goldstream Nature Houise, which is very productive at the moment. 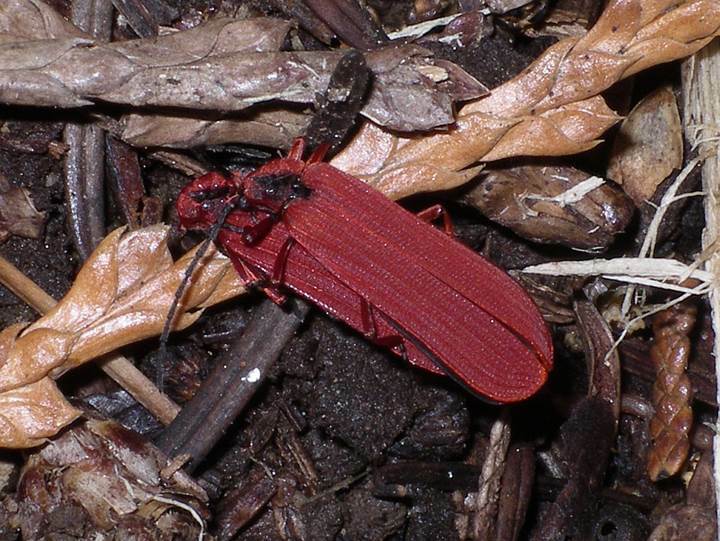 Gerry and Wendy Ansell found these two bright red net-winged beetles on the grounds of Royal Roads University during a fungus field trip on April 4. 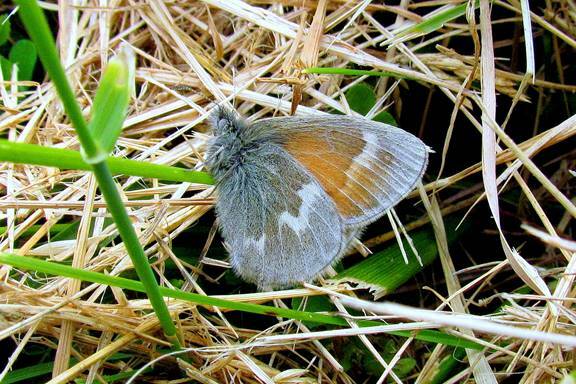 Wendy writes: We have seen only three species of butterflies so far this spring – several Mourning Cloaks, several Satyr Commas, and one Sara Orangetip on Mount Douglas. Annie Pang writes on April 5: Happy Spring! I was in the garden today for a while when I saw my first Cabbage White butterfly land on the Pampas Grass that I was cleaning up. I recently received this lovely picture of one of our overwintering and longest lived hibernating butterflies, the Mourning Cloak, from Marie O’Shaughnessy. its precious life not lost. long after it is gone. 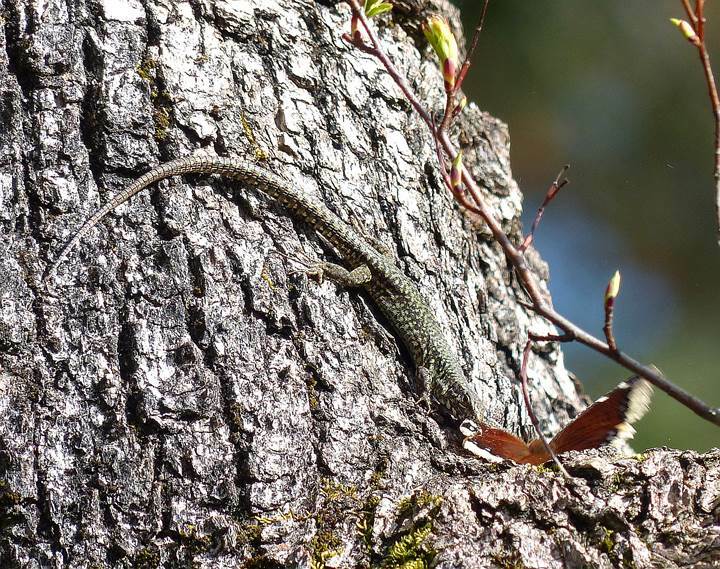 Aziza Cooper writes: Today (April 4) at Gore Park in Brentwood Bay, a European Wall Lizard (Podarcis muralis), an introduced species, grabbed a Mourning Cloak as it was landing on a Garry Oak trunk. The butterfly was struggling, and my walking companion darted forward and bent a small tree towards the pair. The lizard was frightened by the moving branches and dropped the butterfly. The butterfly flew away, probably leaving a chunk of its wing behind. There are many more Wall Lizards today than I’ve seen there in former years, and they are in many more locations. Today’s attack seems to indicate that they might be having a negative effect on the native species. Aziza continues: Today (April 4) at Gore Park I also saw a comma species flying by. Yesterday I saw a Mourning Cloak at Mt. Tolmie summit. 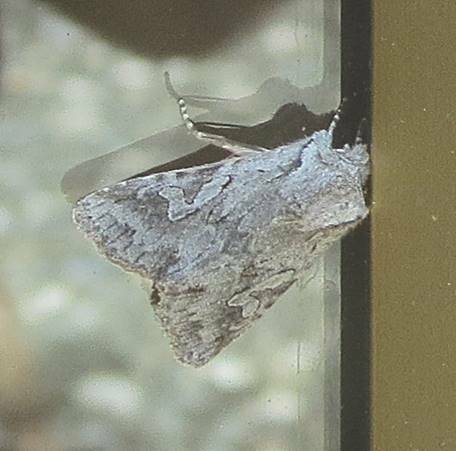 Val George reports a Western Spring Azure from Oak Bay on March 29. Bill Katz photographed a pug and a wave in Haro Woods on March 30. On April 1, Jeremy photographed a Lithophane pertorrida at his Saanichton home. 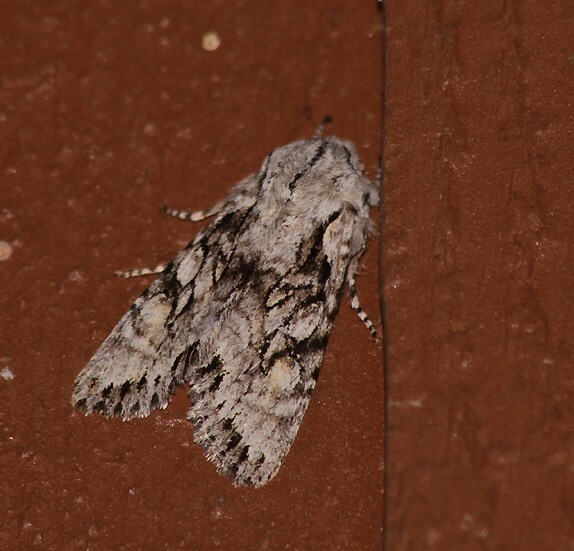 On April 1, Jeremy photographed a Lithophane pertorrida at his Saanich home. Some butterflies are starting to put in an appearance. 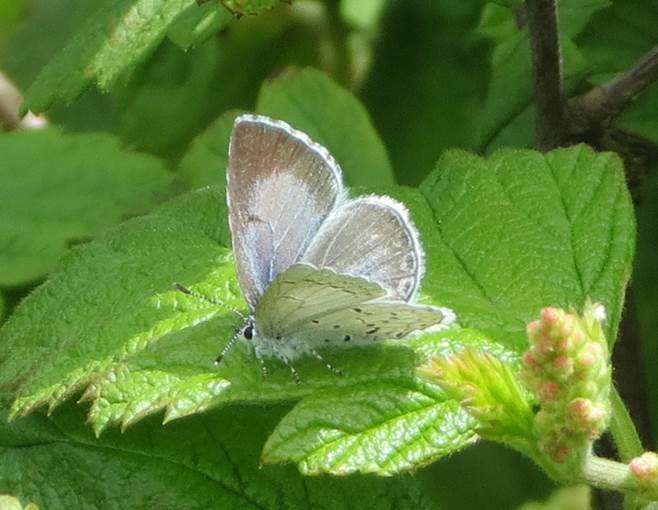 Aziza Cooper writes: Today (April 1) Moralea and I saw many butterflies at Camas Hill, including 5 Green Commas, 2 Moss’ Elfin, 1 Spring Azure , 1 Sara Orangetip and 3 Mourning Cloaks. 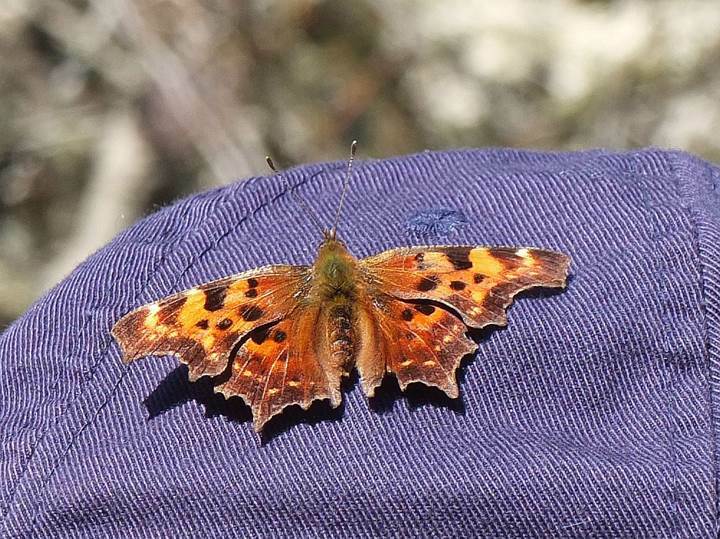 Photos included: Elfin, Green Comma sitting on my hat, and a large moth on a cliff at Camas Hill. I also had a California Tortoiseshell fly by on the Goose Trail near Lindholm Road, and saw four Mourning Cloaks in three locations. 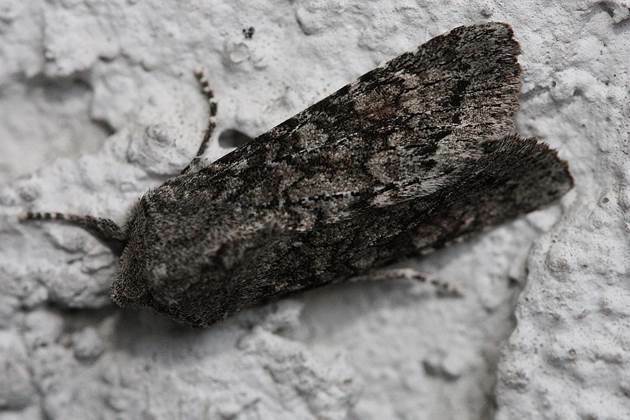 Jeremy Tatum comments: The moths Triphosa haesitata (American Tissue Moth) and Coryphista meadii (Barberry Geometer) are highly variable and extreme examples of the species can be confused. 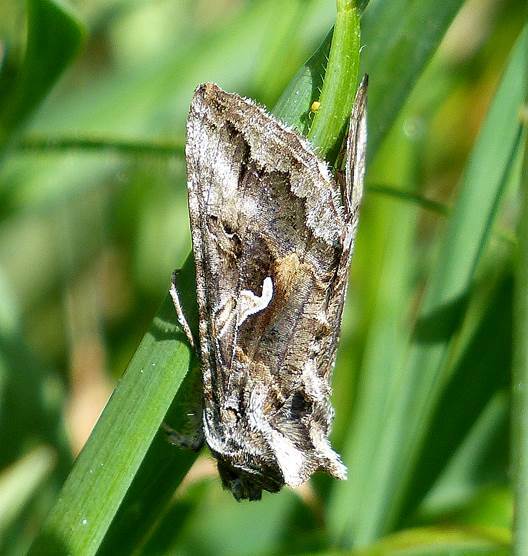 I am pretty sure that Aziza’s moth is Coryphista meadii, and am so labelling it, but I’m willing to be challenged on this! 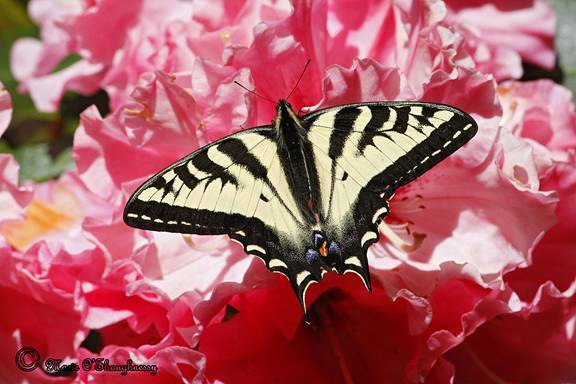 Ken Vaughan, too, sends photos of a butterfly on April 1, as well as two flies and a spider. 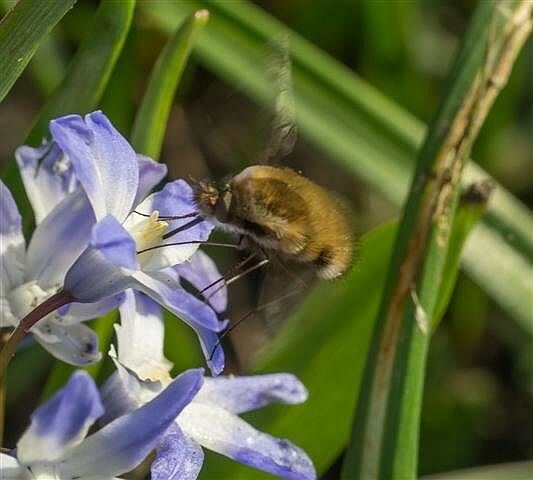 Thanks to Robb Bennett for identifying the spider and Claudia Copley for identifying the bee fly. Well, I don’t think we need hold a gun to Robb’s head. His expertise is good enough for us! 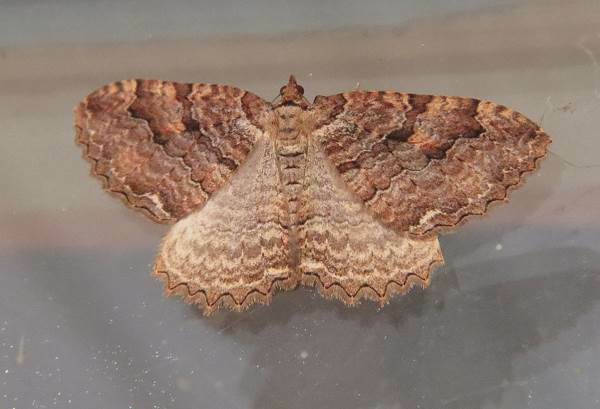 But there are yet more moths to show, including our first prominent of the season, a Gluphisia severa – one of two at Jeremy Gatten’s house in Central Saanich on April 1. 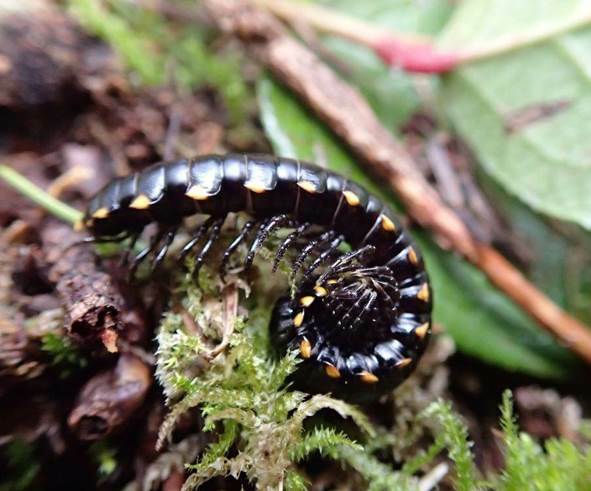 This is an informal forum for terrestrial invertebrate watchers to post recent sightings of interesting observations in the southern Vancouver Island region. Please send your sightings by email to Jeremy Tatum (invertalert@naturevictoria.ca). 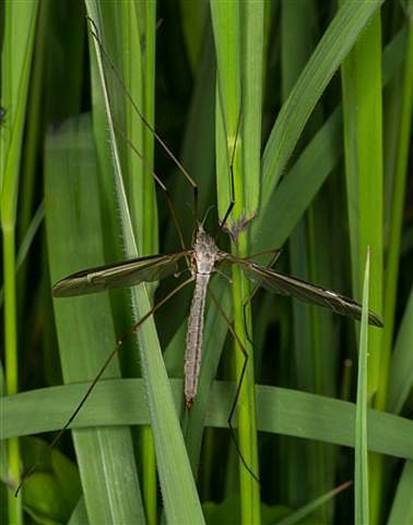 Be sure to include your name, phone number, the species name (common or scientific) of the invertebrate you saw, location, date, and number of individuals. If you have a photograph you are willing to share, please send it along.